In July 2007, a group of seven adventurers met in Oslo, Norway for the purposes of an expedition to discover the northernmost point of land in the world. 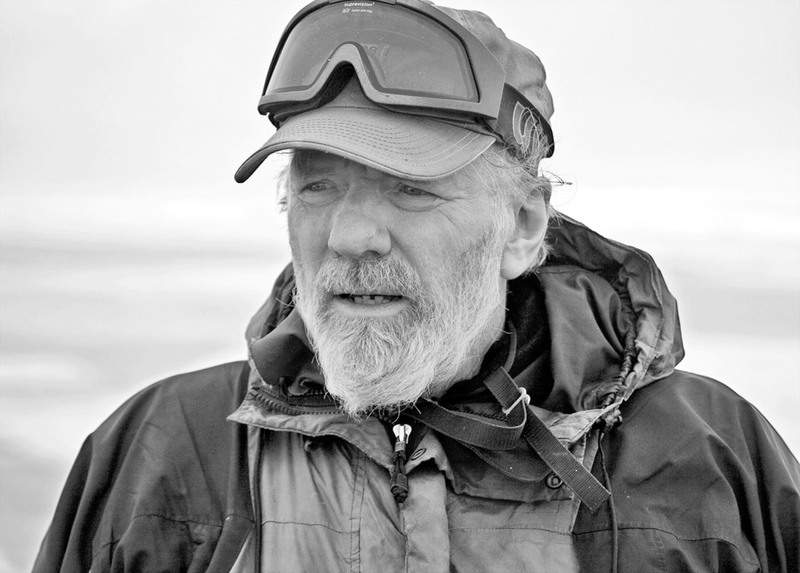 The team leader was Dennis Schmitt, veteran of over eighty Arctic expeditions, who, two years before, discovered Warming Island off the East Greenland coast. Also known as Uunartoq Qeqertoq, it was hitherto attached to Greenland by an ice bridge that, through the process of melting, became destabilized and broke away. 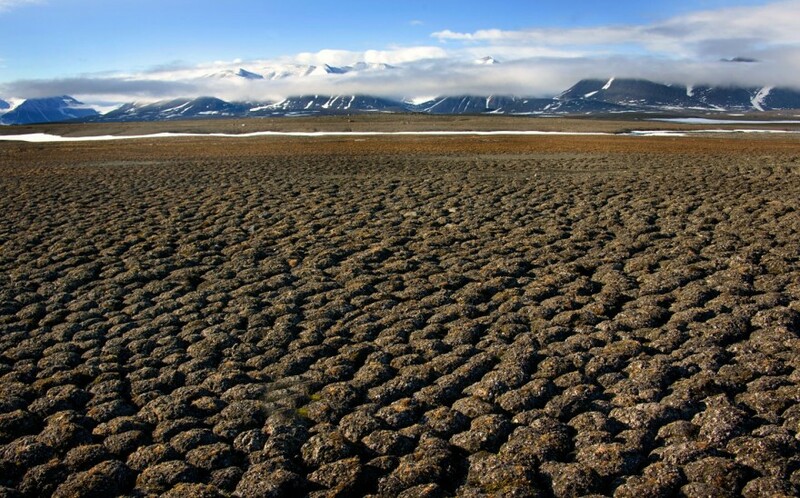 In 2007, Warming Island became a worldwide symbol for climate change and is now a prominent feature of the Oxford and Times Atlases of the world. 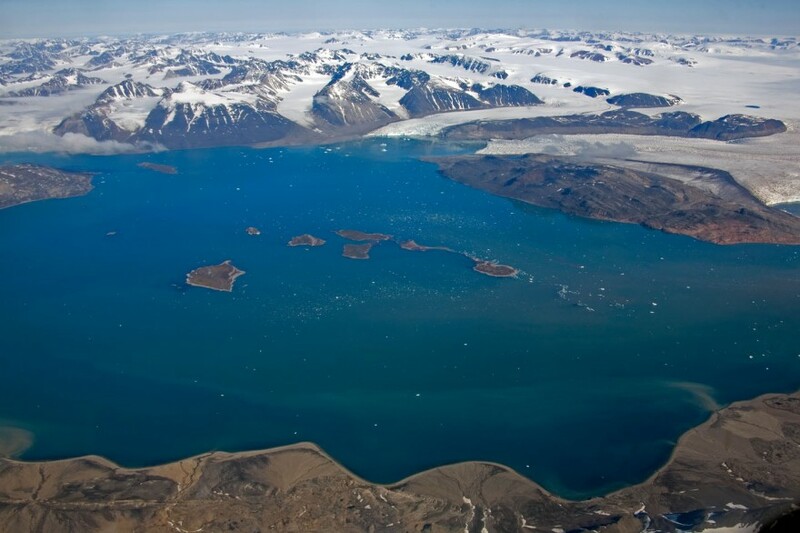 Warming Island, Liverpool Land, East Central Greenland, 2006 – Warming Island was thought to be a part of the mainland until 2005, when Dennis Schmitt discovered it was, in fact, an island. In 2006, Dennis, three others and myself surveyed the island for the first time. The broken ice bridge can be seen in far left center of this photograph. 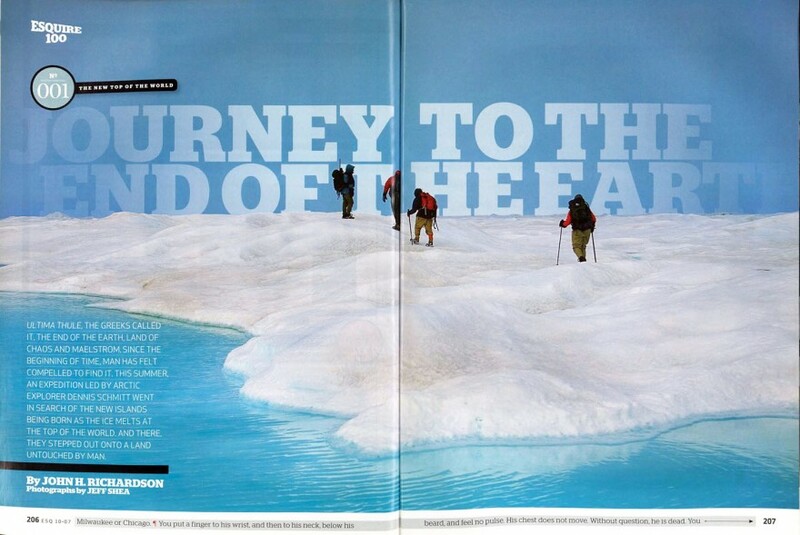 The Euro-American North Greenland Expedition July 2007 members included John H. Richardson, writer-at-large for Esquire Magazine. Holly Wenger, a leader for white-water canoe trips for the Sierra Club, was the team administrator. 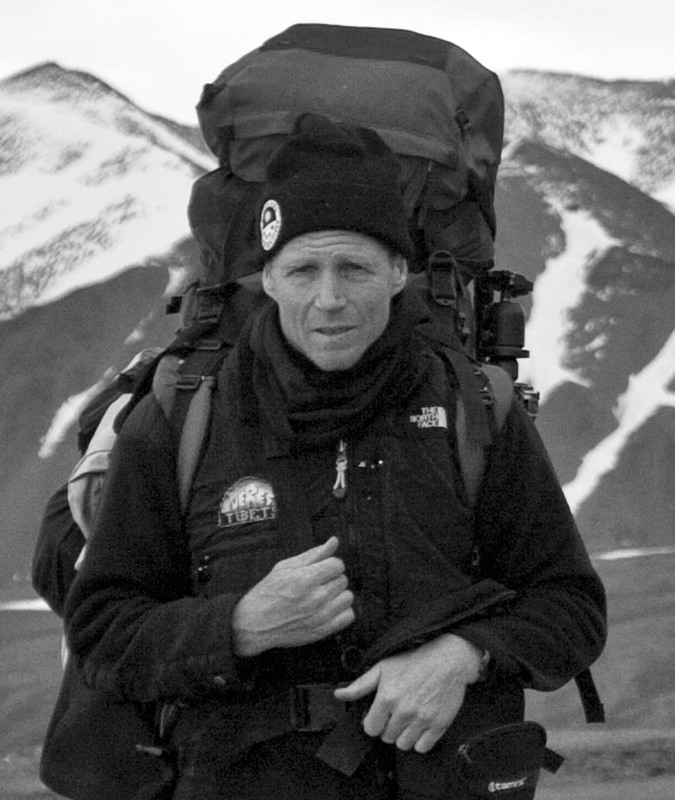 Other expeditioners included Steve Kabala, architect and rock climber, and Bob Mittleman, adventurer. I, Jeff Shea, MN Ã¢ÂÂ92, served as the team photographer and videographer. Renato Pappa, for whom the prefix Ã¢ÂÂEuroÃ¢ÂÂ in the expedition name was added, was an Italian journalist who dropped out after touching ground in North Greenland. Unfit for the journey beyond, he returned to Station Nord with the Twin Otter. Survey and document Ultimathule (the northern point) and Ã¢ÂÂStray Dog Islands,Ã¢ÂÂ depositional islands exhibiting impermanence in the area. Survey the Ã¢ÂÂSifs TrenchÃ¢ÂÂ and Ã¢ÂÂSifs Glacier,Ã¢ÂÂ about 40 miles in length, and then compare this data with previously taken photographs to determine the extent of change in this polar glacier. 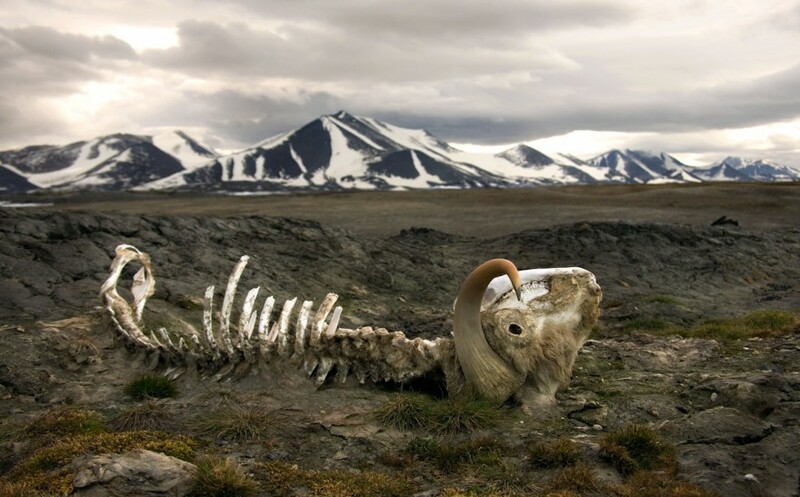 Sight wildlife, including muskoxen, weasel, hare, bears, fox, wolves, and birds. Search for Independence and/or Thule archaeological sites. Despite the latitude here we are on the rim of an extreme high polar maritime microclimate generating the enormous Kilen icecap. Station Nord is a military outpost occupied by Danish soldiers in the Sirius Patrol. We will very likely overnight here. We will certainly refuel. 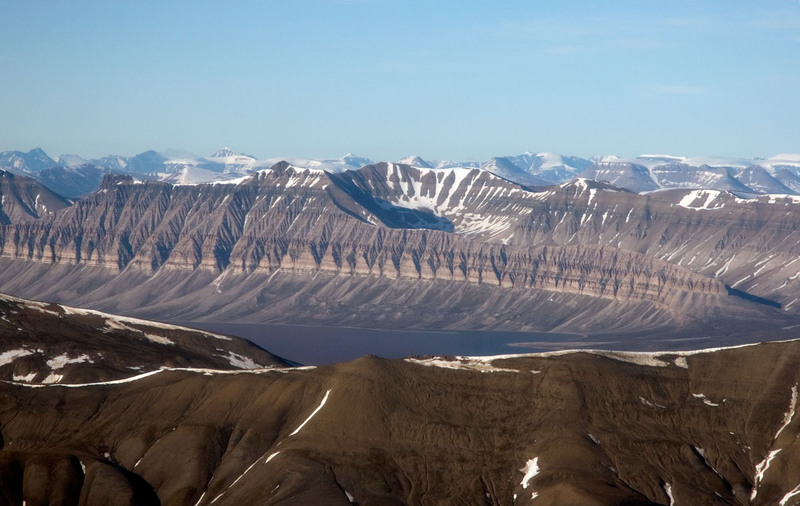 July 6, 2007 – We leave Station Nord on a bearing NW across the Independence Fjord and into the extreme polar desert of Peary Land. Some of the landscape here is Mars-like, some is sandstone Inuitan Orogen geological province. The Nord Kronen icecap gets us to Frederick Hyde Fjord, the northernmost large fjord in the world. 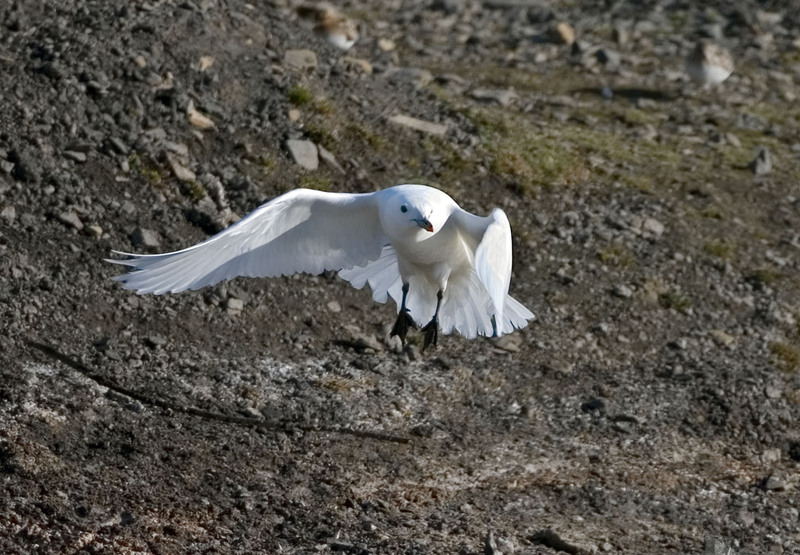 Fly from Longyearbyen to Bliss Bugt (approximately 83-40Ã¢ÂÂ N), landing in a depositional stream. March westerly along coast to establish base camp 18 km distant. 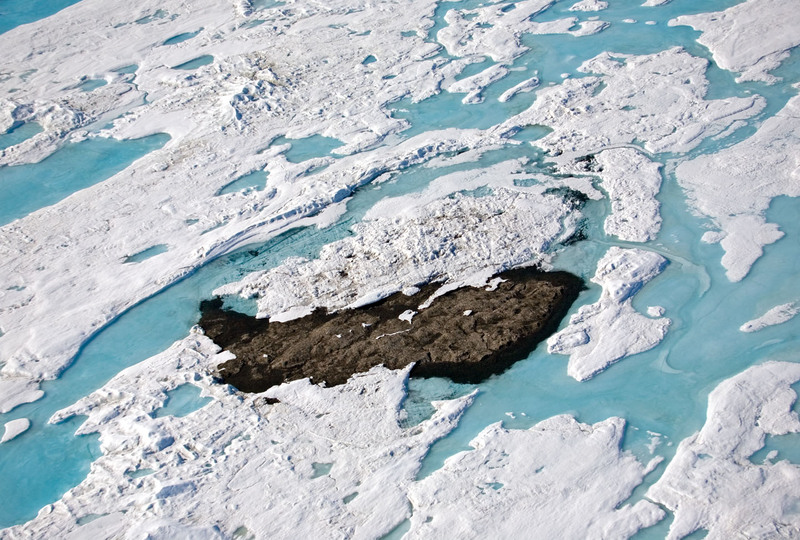 Proceed on to sea ice around Kaffeklubben Island, using inflatables if necessary. 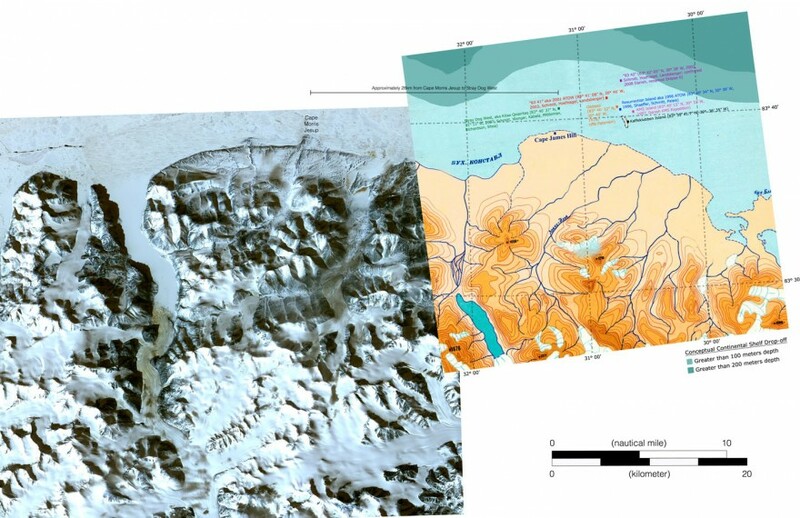 Study and document the features around Kaffeklubben to determine if there is some other permanent geographic feature that is more northerly than Kaffeklubben, currently considered the northernmost point of land. Return to base. Follow a drainage to a lake never before visited in the HH Benedict Range and survey area from high point above lake. In actuality, there were delays. We departed from the USA July 1, 2007. We convened in Oslo via Reykjavik and Keflavik, Iceland, on July 2. 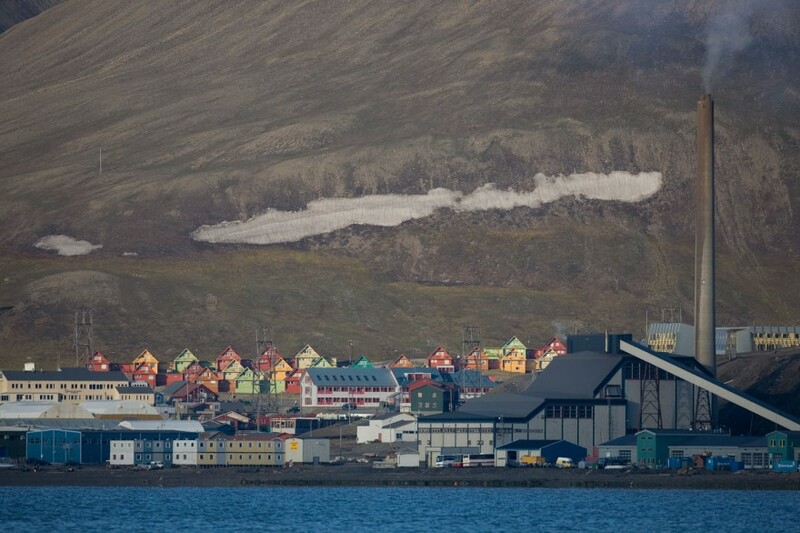 We arrived in Longyearbyen on the island of Spitsbergen on July 3. 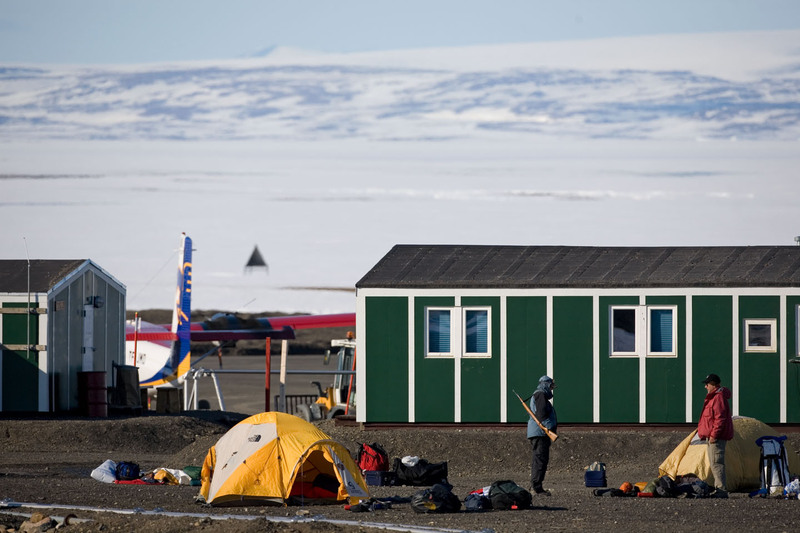 Due to logistical problems with passage on the Twin Otter, we camped there until July 7th. 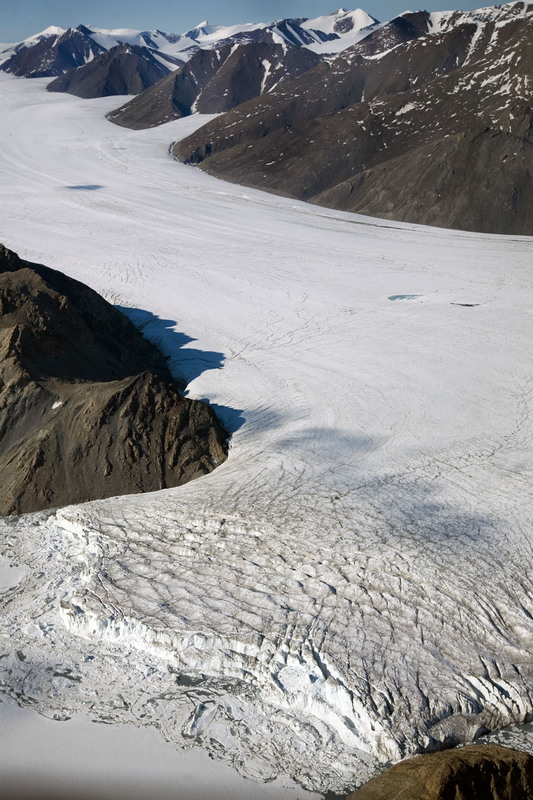 Then, we flew to Station Nord, Greenland, 81ÃÂ° 36.11Ã¢ÂÂ north latitude, where we camped for the night. We landed at Station Nord, where we camped for one night. On July 8, we flew in a Twin Otter aircraft to our base camp in the northernmost reaches of Greenland, within miles of Cape James Hill. North Coast on way from Station Nord to Bliss Bugt, Looking West, Greenland, 2007 – From the ground it is not always clear what is a snowdrift and what is frozen ocean. 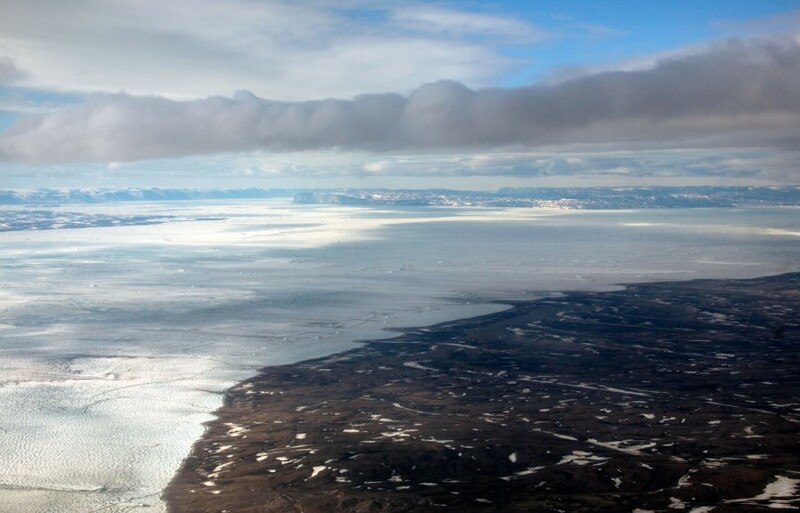 North Coast on way from Station Nord to Bliss Bugt, Looking East, Greenland, 2007 – This photograph shows (within about 40 kilometers) the far northernmost coast in the world. Beyond the coast is the sea ice. 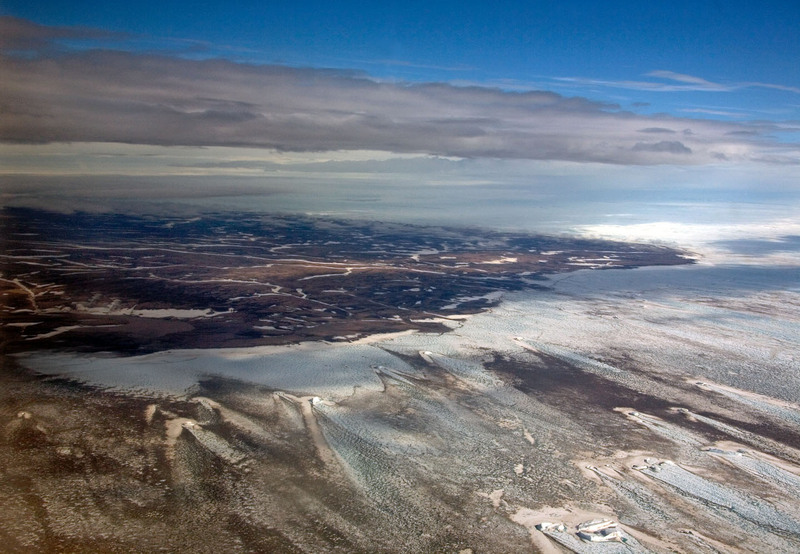 This photograph was taken from the Twin Otter aircraft, looking back to the east. We landed on the outwash plain at approximately 83 degrees 35 minutes north latitude on a rough but flat patch of ground. We all piled out of the plane, including Renato. It was windy, gray and cold. Renato said goodbye then re-boarded the aircraft. The door closed. The Twin Otter flew away. We busied ourselves setting up tents. At about 5 p.m., John and I went for a walk. Originally, weÃ¢ÂÂd planned on going for a short walk, but it ended up being much longer. We crossed a stream, trying to avoid boggy ground. We trudged up a slope and got a point where we could look out. John went on ahead while I photographed the camp behind. I followed up the gradual slope. Like most upward slopes, it appeared weÃ¢ÂÂd reach a high point, only to find that it kept going up. John had a good eye. 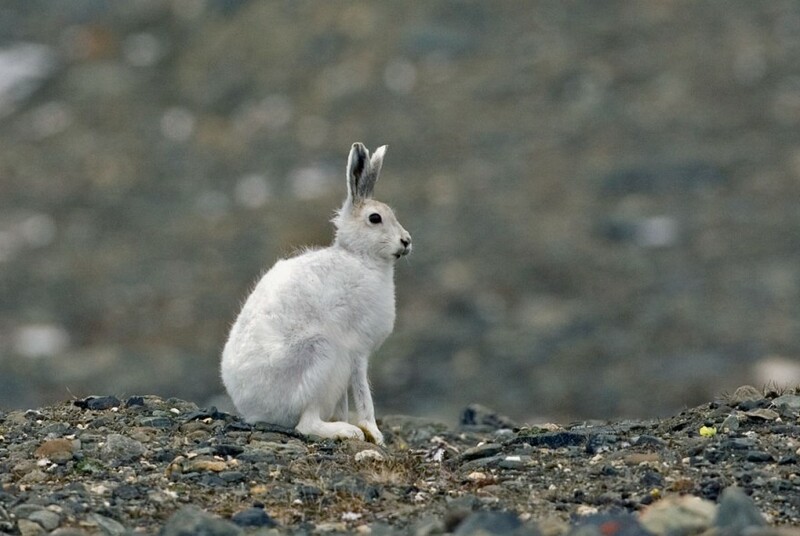 He pointed out an Arctic Hare ahead. We stopped. 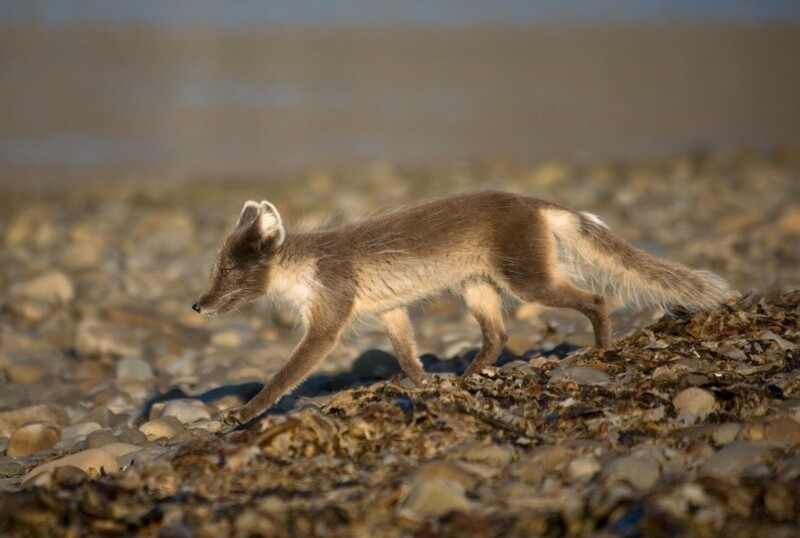 I have learned that approaching animals can be done more successfully if the approach is done facing them directly and walking slowly towards them, without moving from side to side. 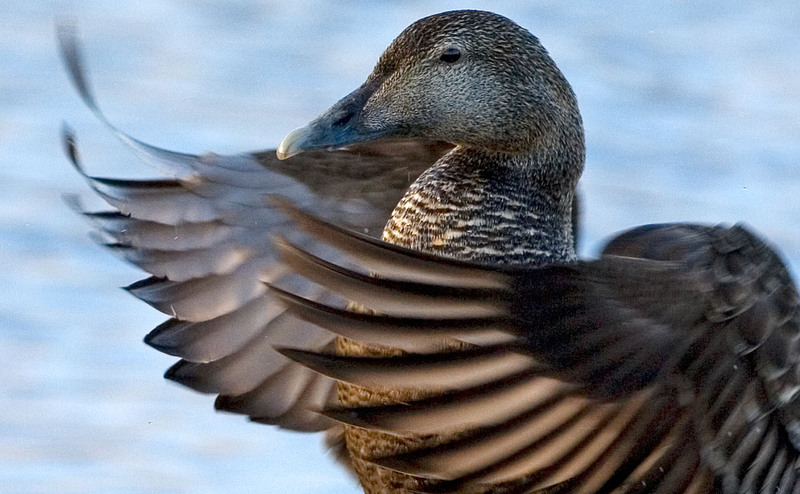 Birds that have eyes on the sides of their head and are looking at you with one eye do not have very good perspective vision, so it is difficult for them to tell if you are walking towards them. Thus, with respect to the skyline, it is best if you do not move left or right or up or down. 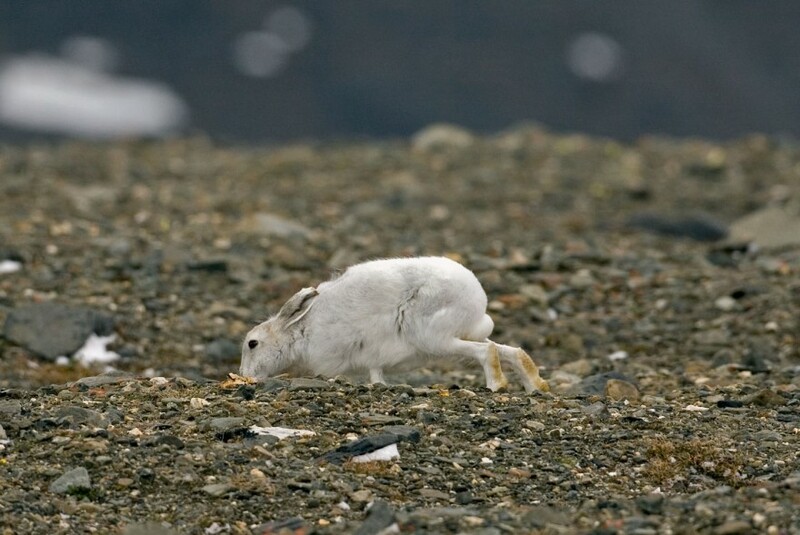 This technique seemed to work reasonably well with the Arctic Hare. Arctic Hare [Lepus Timidus], Bliss Bugt, Greenland, 2007 – To get these photos, I had to stalk the hare. Writer John Richardson from Esquire patiently accompanied me. He thought I was nuts. Then John and I moved freely. We reached a point where we could now see down towards the foot of the mountain, which was below and in the distance. Even though the mountain had seemed fairly close at first, it was now still very far away. I was told the Arctic air made things look closer. After taking photographs of the geography, including a valley in the distance running between the mountain facing us and the one to its right, we moved on. There was a mossy pile of rocks. I suggested to John it could be an archaeological site. He seemed to agree it looked like it could be, but neither of us were sure. We walked back. On the way up the slope, we had found a good view of Kaffeklubben, and we had agreed we would photograph it on the way back. On our return, Kaffeklubben was again in sight. When I found the desired spot, I set up my tripod and took photographs. We descended a slope. 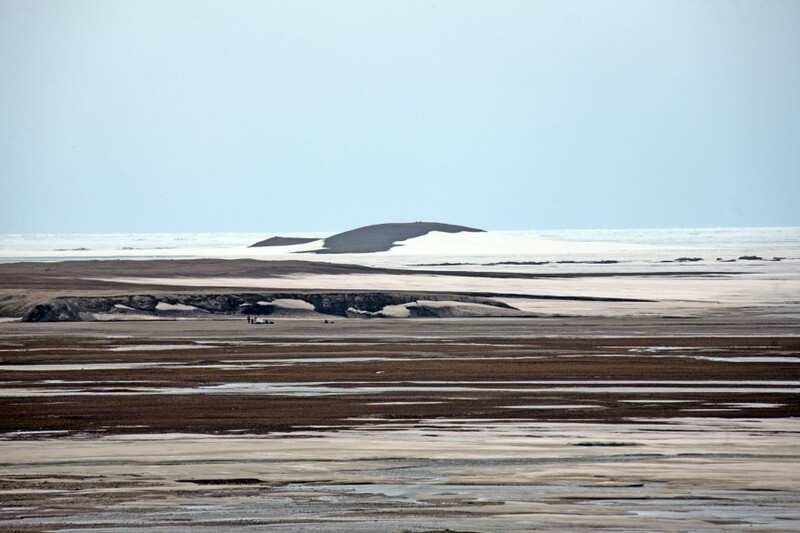 I photographed the camp and the sea ice. It looked surreal. The sea ice, extending into the distance behind the camp, looked like a wall of stratified ice. I was amazed. 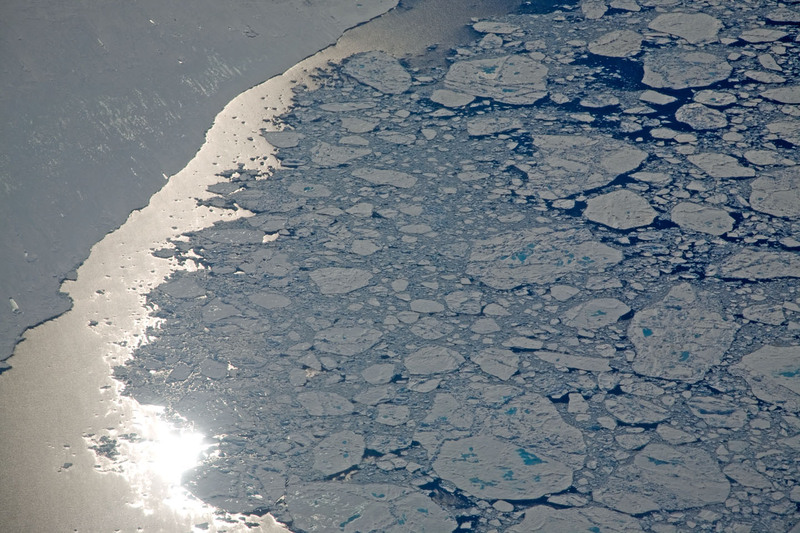 It turns out this effect was from the myriad melt pools of aqua blue water pocketing the sea ice. There were absolutely no trees. Not one. Not even bushes. The tallest plant was only an inch or so high, or in the case of flowers, maybe several. I descended, stopping to take photographs of the camp with small figures of people in it. When we finally got back to camp, it was about 10 p.m. WeÃ¢ÂÂd been gone over five hours! It seemed like half that time. I made a meal and retired for the night. In the morning, our party split into two. Dennis, Bob, Holly and Steve went off first and John and I followed. 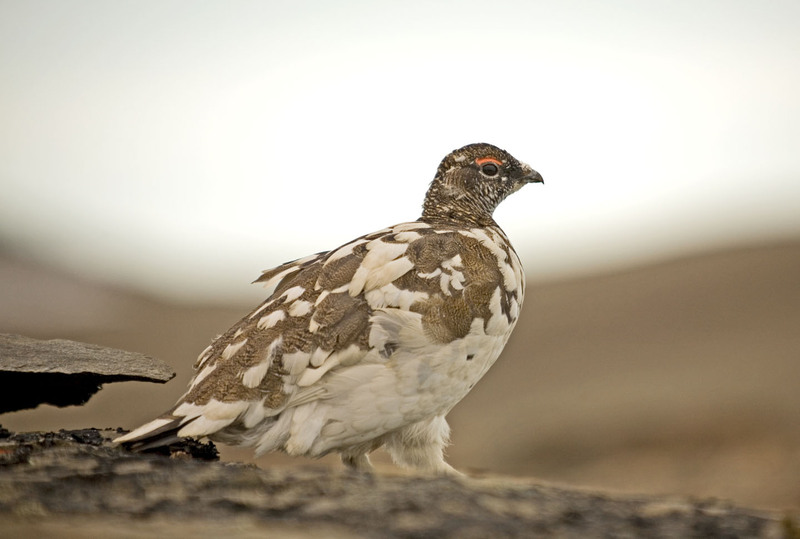 John and I spotted a Rock Ptarmigan. 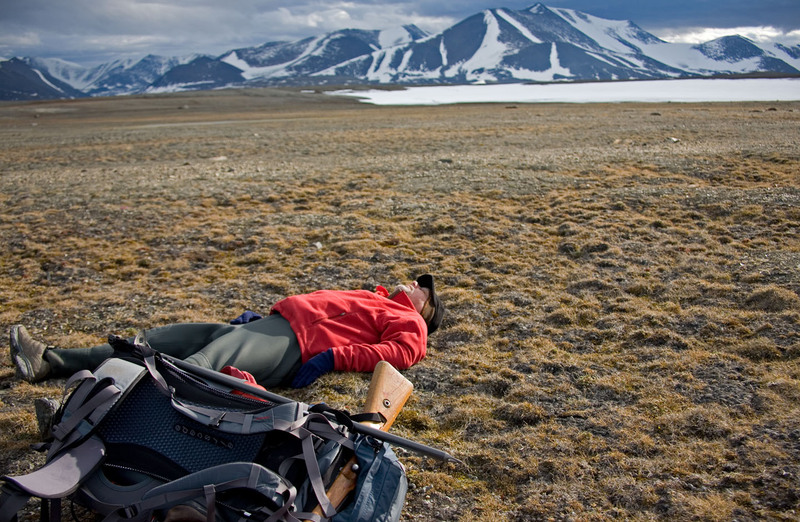 Waiting patiently while I photographed animals, Rock Ptarmigan [Lagopus mutus], Richardson takes a rest on the tundra. We came to another snow gully. As I reached the other end, my legs sank to just below the knees in icy slush. I was not wearing waders. I continued on, reaching the other side in a few steps. I looked back. John was behind me. Rather than get caught in my slush, he went to the left. I moved on about a hundred meters or so. I wanted to gain a little elevation out of the gully so that I could see if someone was coming. I sat down. I waited ten minutes perhaps, wondering where John was. The wind blew. The sun was out now and again, and sometimes it hid behind the clouds. There was no place to seek protection from the wind. John came up. Had fallen in up to the top of his legs! It sounded uncomfortable. HeÃ¢ÂÂd been stuck there alone in the ice slush. We moved on. I told John that if we didnÃ¢ÂÂt find the others by the time we reached that far snowfield, we could always choose to camp for the night. We had everything we needed. We crossed a barren slope. I stopped and looked out. Then I noticed, though barely visible, what appeared to be human figures in the direction of Kaffeklubben. Sure enough, it was the others! We could see they were setting up a tent. I saw Bob coming towards us. He came walking up to me. Bob went off to talk to John. John started walking towards camp. After a short while, Bob followed. The camp was some distance off, in front of a little rise in the land between it and Kaffeklubben. There were rivulets of streams between me and the camp. I went down a different way so that I might maintain a view of Kaffeklubben. Once at camp, I saw there were two tents set up, HollyÃ¢ÂÂs and JohnÃ¢ÂÂs. With mine, that would make a third. Dennis and Holly were holed-up in hers. It was a bit cold. I went about setting up my tent. John and Steve were resting. Bob was mulling about with no shelter. Bob had already collected rocks to weigh down my tent before I arrived. He was eager to help me set up my tent. Eventually, I got my things settled and I crawled into my sleeping bag. The tent was just big enough for two sleeping bags, but I had thrown a lot of my important gear in near my head. My battery bag went in the bottom of my sleeping bag near my feet, in order to keep the camera batteries warm and charged. I fell off into a long, long sleep. Kaffeklubben and Camp 2 Site after Losing Tent, North Greenland, 2007 – John and I spotted the rest of the group trying to put up a tent (center left). Kaffeklubben Island, the official northernmost point of land in the world, appears in the distance as a hill, about one kilometer off the north coast of Greenland. I woke at about 10 p.m., hungry. I set about making a meal. I had an idea to go back to Base Camp. The others were not going to leave until morning, but I was fully rested and full of energy. I told Dennis about my plan. He seemed receptive to it. Later, he returned to talk to me. He seemed to have changed his mind. If I recall, some comment was made about keeping everyone together. I mentioned to him that I had left my fuel pump in the bottle IÃ¢ÂÂd left at Base Camp. I mentioned that they break once in a while and that it would be good to get it. He said, Ã¢ÂÂThey break all the time.Ã¢ÂÂ Later, I went over to talk to Dennis and Holly. After talking it out, it seemed like a good idea for me to go. For one thing, I wanted to get my bigger tent, just in case there was bad weather. I also wanted to get my 500 mm lens. Also, Steve had not brought his waders. I think this is what convinced Dennis for me to go. 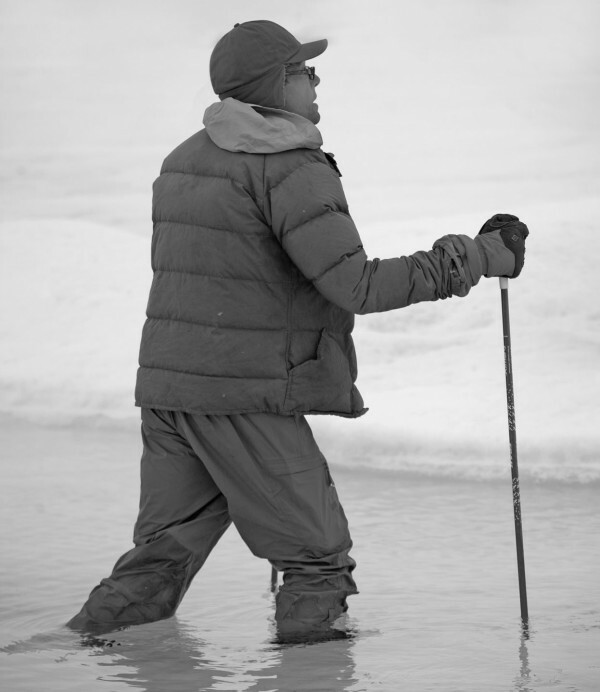 Without waders, Steve could not travel on the sea ice. That and the fuel pump. Also, I could bring back excess gear to Base Camp and retrieve wanted goods. I wanted to bring back BobÃ¢ÂÂs tent poles and tent fly, since they were of no use. (The body of the tent had dropped off of BobÃ¢ÂÂs pack on the walk.) The unnecessary poles would only add to our burden on our return. My how time flies here! By the time I was ready to leave, it was 4:45 a.m.
Today was one of the grandest days I have ever had. I left fully rested. Dennis had informed me that they planned to move on to their next camp before I returned. He told me that they planned to move the camp to the opposite side of the next big river meeting the coast, right along the coast. It seemed simple enough. I considered there were four major steps to today. One to get to Base Camp, two to make the switch of gear, three to make it back to Camp 2 and four, to find Camp 3. What was critical was that I was there tomorrow morning, so that I would not hold up the groupÃ¢ÂÂs plan to search on the sea ice for Western Island (the teamÃ¢ÂÂs original name for Stray Dog West). I set off full of vim and vigor and excitement. Straight off, I set my sights on the snow-ravined mountain in the distance, the one that sat above the landing strip and our Base Camp. I made a beeline for a point just right (west) of it, not wanting to overshoot it. I crossed the bogs of the plain, and then marched up the slope. I did not attempt to retrace my steps of yesterday. I thought there was a better route. I came to the edge of a wide expansive plateau. On the plateau I trudged on varying terrain, sometimes tundra, sometimes bog, sometimes crossing a river, sometimes on solid earth. I would look back occasionally to try to get a sighting of my path and what it might look like on the way back later in the day. At one point, Kaffeklubben was not visible, but when I rose up a small slope, Kaffeklubben was once again in sight. This was a better route being up high, as it avoided the ups and downs of crossing the ravines closer to the coast. I finally came to a great ice field. It would be risky to cross it, so I turned left and followed its edge, backtracking to the northeast. It is usually easier to walk a little further on easy ground around an obstacle than to push your luck by trying to press straight into, up, down or through it. I reached a place where there was a big rock. One of the preparations that weÃ¢ÂÂd made before I left was to test the walkie-talkies. TheyÃ¢ÂÂd not worked yesterday. We agreed to have our first communication at 8 a.m. Thus, IÃ¢ÂÂd been minding my watch. It was nearing 8 a.m. now. I dropped my pack and I tried to radio to Holly. Nothing. Just then, I looked up and noticed something a few hundred meters away. I realized it was a muskox! The radio transmission not having worked, I put my walkie-talkie away. 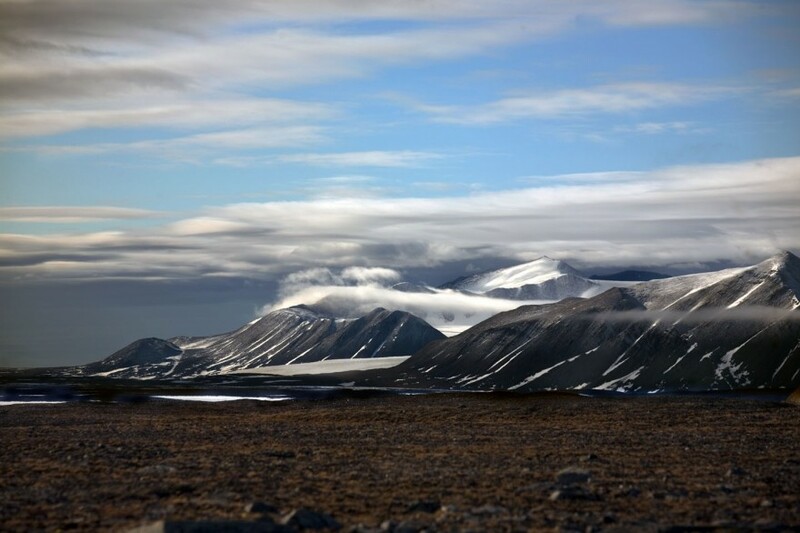 Tundra and Mountains, Near Cape James Hill, Greenland, 2007 – I used the mountains as a visual way point. I got my camera and tripod out and I walked slowly in the direction of the muskox. I saw the rock as a possible place to photograph from, as it was high enough for safety. But it was risky to get to it. Before I reached the rock, the muskox seemed to notice me. I got up on the rock. From there, the muskox was in a position where Kaffeklubben was behind it. I saw about five muskoxen in all, including two calves. Wanting to get closer, I got off the rock and walked in their direction. Reaching solid ground, I lay down and photographed them. I moved meters closer still to a small pool of water, then slowly retreated to my pack. I followed the edge of the ice field, moving imperceptibly towards the sea ice. As the snowfield worked its way towards the lowlands, it reduced in size, and I crossed it. I descended slightly towards solid ground. I looked out. In the distance off to the right, I could see tents. As they were barely visible with my naked eye, I got out my telephoto lens to confirm that it was indeed the Base Camp. I arrived a half hour later. It was 12:15 p.m. I had missed my 10 a.m. walkie-talkie reporting time. On the way into camp, IÃ¢ÂÂd tried to call again. I heard a crackle on the walkie-talkie once, but other than that, there was no sign of communication. Once at camp, I set about making some coffee and sorting out gear. I had to move everything out of my tent and into BobÃ¢ÂÂs. I had to do so because I was taking my tent with me. By the time I left, it was after 4:00 p.m. It took me just over an hour to get to the rock where IÃ¢ÂÂd photographed the muskoxen. They were no longer there. I dropped my pack. I went off to the right and down now towards the northeast. It was not long before I saw the muskoxen again. 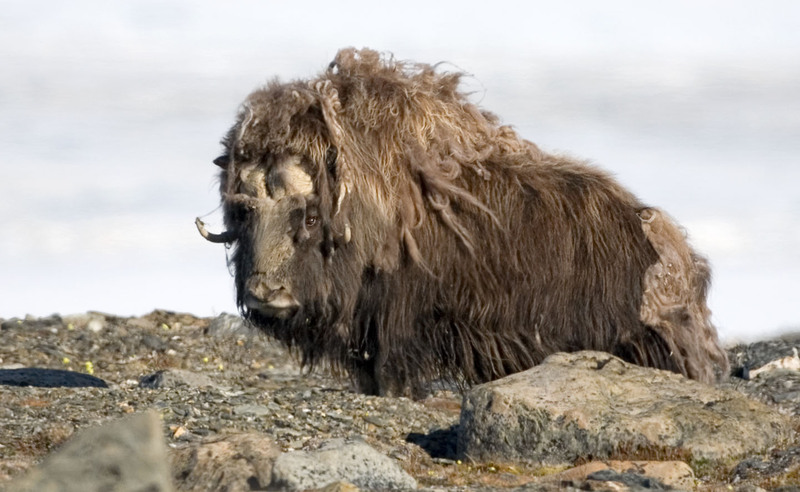 Muskox [Ovibos moschatus], North Coast, Greenland, 2007 – I saw about twenty muskoxen on the north coast of Greenland. The one in this photograph fled and I had to go search for him. As I snapped this photograph, he noticed my presence. I stood as still as I could. I was told by the pilot that muskox were more dangerous than polar bears. Just then, another muskox that IÃ¢ÂÂd not noticed moved up the slope a few meters, grazing, coming into view. He was only about 90 meters away. He looked up at me, staring. seemed aware of my presence and seemed to move away accordingly. At one point there was an ice gully between us. I felt safer. I think they did too. I was photographing the five muskoxen, of which two were calves when, again, I was surprised by another one to my lower left. This made six muskoxen in all. Eventually, they moved off and down and away towards the sea ice. I walked back and donned my pack again. So far today, I had spent a total of four hours shooting photographs of muskoxen. Now, I continued retracing my steps of earlier today. It was hard to tell if I was on the same route IÃ¢ÂÂd used in the morning. I ambled across the boggy field. I lost sight of Kaffeklubben. When I reached the other side of the plain and came to its edge, Kaffeklubben appeared again. The walk down the slope seemed to take longer than IÃ¢ÂÂd remembered. Mountains, North Greenland, 2007 – The landscapes in North Greenland are marvelous. For one thing, the air is clearer than any one might ever see elsewhere. One of the consequences of this is that things that look close may be quite far away. 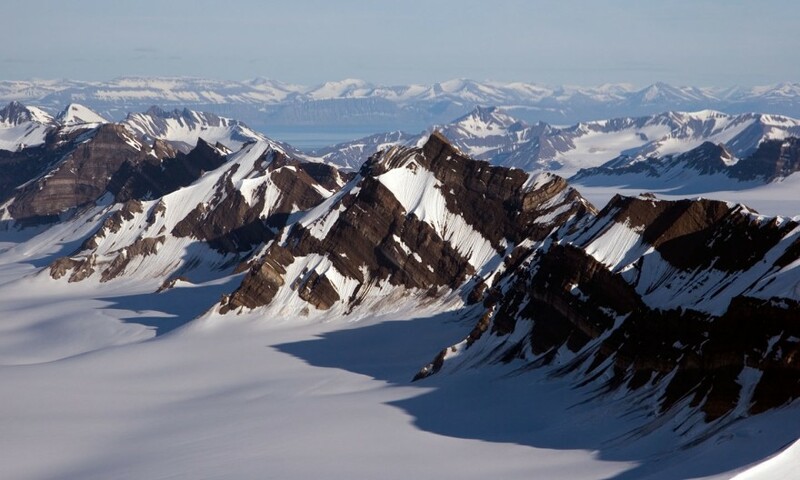 In fact, our expedition was almost always in sight of a certain mountain range. This photograph is taken quite near the most northerly land in the world, only a few kilometers from the sea ice near Kaffeklubben and Stray Dog West. By now I was tired. IÃ¢ÂÂd been up for about 24 hours. I would have preferred to sleep, but IÃ¢ÂÂd only completed three-quarters of my dayÃ¢ÂÂs tasks. I set about cooking a meal. I repacked my bag, trying to take all I could take with me. But ultimately, I could not bring it all. I left some articles behind. It was about midnight when I departed again to try to find the place where the others had set up Camp 3Ã¢ÂÂ¦. I had to stop frequently now. My pack weighed about 90 pounds. I walked up the river a short way and then crossed it. I headed roughly due west across the river, past snow, and up to dry ground. Rolling terrain fell to the sea. Kaffeklubben was not distant, visible just off the coast. propped up on his ice ax. No one was awake. The camp was on this side, not the opposite side, of the river. The river was not very big. Ã¢ÂÂWhat time are we waking up?Ã¢ÂÂ I asked. I went to my tent, exhausted. But I felt dirty, so I grabbed my liquid soap, took my shoes off, and walked barefoot on the snow to the river. I submerged my whole body in the icy water and soaped myself down. Then I went back to my tent, shivering, and retired for the night. Ã¢ÂÂAbout fifteen or twenty minutes,Ã¢ÂÂ he replied. We probably didnÃ¢ÂÂt actually leave for an hour and 20 minutes, and maybe more, as later I think someone said we left at 8 a.m. We left in a group. We were off to Ã¢ÂÂWestern IslandÃ¢ÂÂ (later dubbed Ã¢ÂÂStray Dog WestÃ¢ÂÂ by Holly Wenger). Dennis had all but eliminated Ã¢ÂÂOrange IslandÃ¢ÂÂ (apparently ferric oxide) from the list of candidates for the worldÃ¢ÂÂs Ã¢ÂÂnewest northernmost point of land.Ã¢ÂÂ Western Island, it seemed, was the most likely. It was there that we set our sights for today. Dennis led the group. The group broke up naturally into different subgroups. John kept up a conversation, talking about this and that. I didnÃ¢ÂÂt realize it at the time, but all the activity and conversation on this outbound part of the dayÃ¢ÂÂs journey made it seem easy and much faster than it might have been. At one point when I was catching up (after filming and photographing them go by me), the group stopped. I filmed them talking about history. We proceeded. 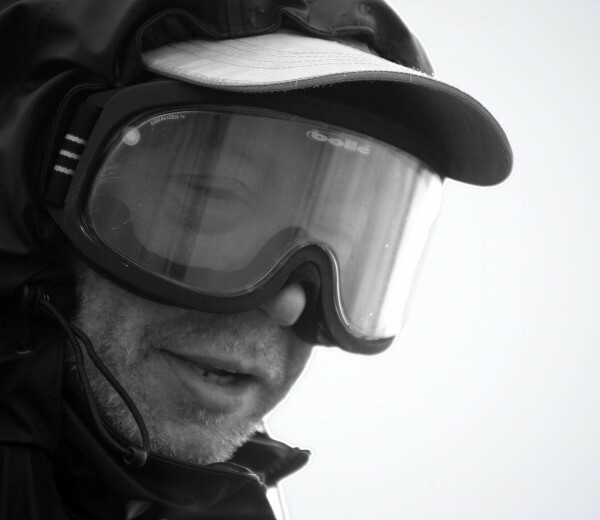 Dennis took an occasional GPS reading to establish at what point we would embark north out on to the sea ice. I donÃ¢ÂÂt know how long we walked along the beach. In some sense, it seemed as short as 45 minutes, but it certainly did not seem like more than 2 hours. Dennis stopped. 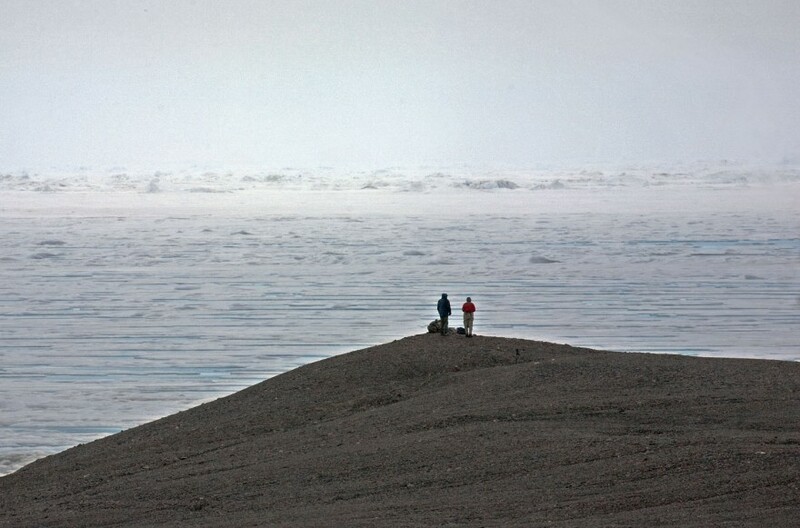 He assessed our position and went to the shore to see the sea ice conditions at this place. He told us we would go from this point. I got out the meal IÃ¢ÂÂd prepared and those that were hungry shared it. I immediately fell behind, trying to film them. Before too long, maybe fifteen minutes, they stopped so that people could put on their crampons. I joined the others. Steve had borrowed my step-in crampons. I put my other pair on, and I helped Steve fit his. Fortunately I had the little wrench, which I used on SteveÃ¢ÂÂs crampons. Bob also borrowed it. We continued. 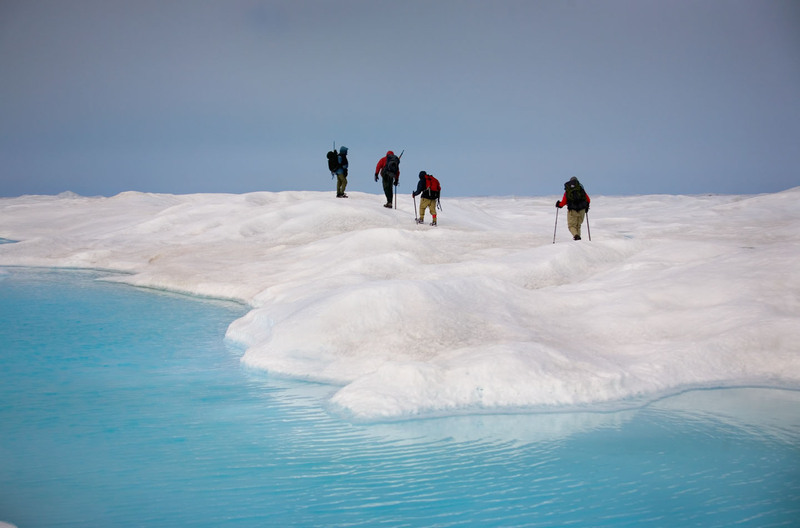 Expedition On Way To Discovery of Stray Dog West, Sea Ice North Of Greenland, July 12, 2007 – Dennis SchmittÃ¢ÂÂs team ventures out onto the sea ice near Cape James Hill, not far from the northernmost coast in the world, Cape Morris Jesup, Greenland. That day we set foot on Ã¢ÂÂWestern Island,Ã¢ÂÂ which Holly Wenger dubbed Ã¢ÂÂStray Dog West.Ã¢ÂÂ This photograph appeared in Esquire in October 2007. 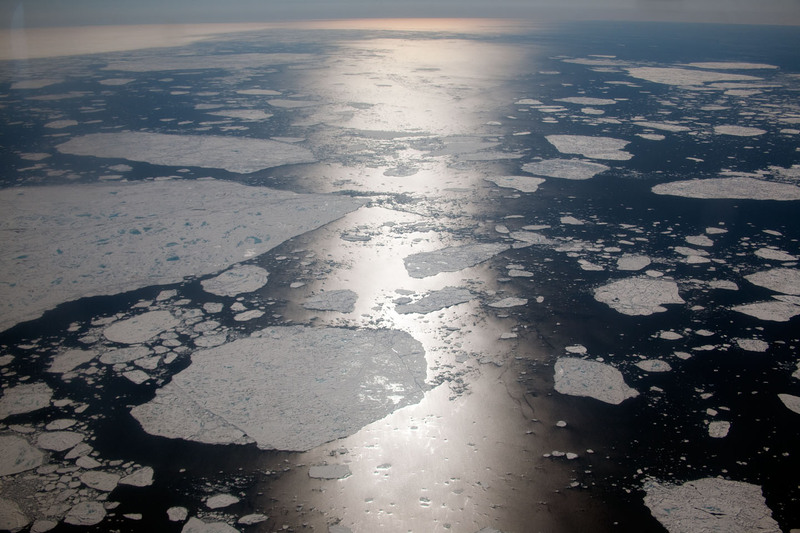 The sea ice is spectacularly beautiful. 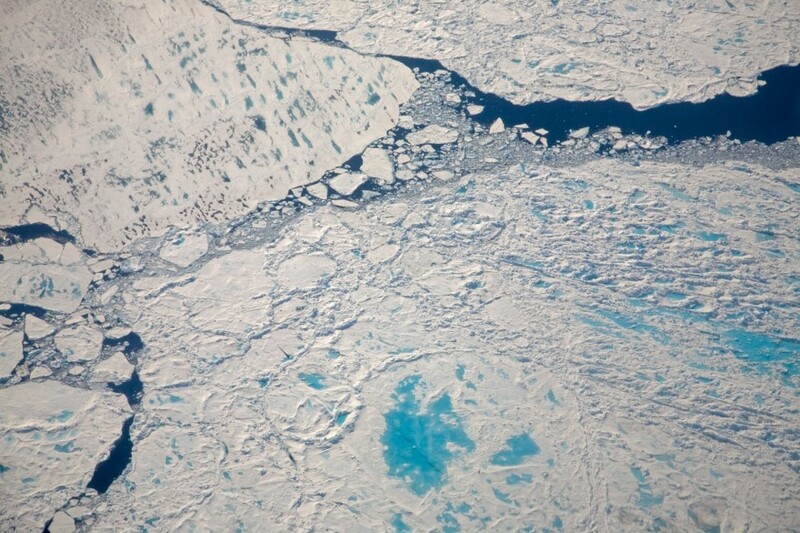 The melt pools are dazzling aqua blue. They are all shapes, surrounded by mostly pure white snow and ice. We tried to avoid going into the deep pools. We preferred to walk around them on the ice and snow. 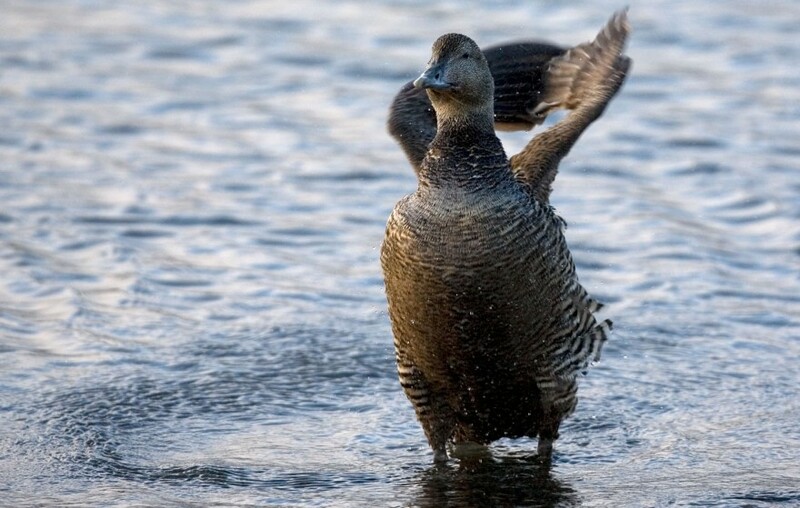 But when they were shallow, we just walked straight across the pools, as we were wearing waders. Waders are waterproofs that fit inside the boots. So, other than the boots themselves, our feet and legs remained perfectly dry. We got to an area with large melt pools. I attempted to go around to the right and Dennis went left. It seemed he cut back in my direction, but then he went off left again. I ended up about 120 meters ahead, where I stopped and dropped my pack. I filmed the others. TheyÃ¢ÂÂd stopped on a small ice mound. I was looking at some ice features protruding from the level horizon. That was where they had been headed. When they started again, Dennis went off to the left. I followed from where I was, meeting up with them. Dennis and the others indicated that the Ã¢ÂÂislandÃ¢ÂÂ was close. John opined that, as a point of honor, Dennis should place the first step on the island. From here, it was Bob who went off in the lead. I called out to Bob to slow down. We moved together. I asked how far it was. Ã¢ÂÂItÃ¢ÂÂs right there.Ã¢ÂÂ I looked ahead. There was a flat gravel feature on the ice. There was a long melt pool, like a moat, separating us from the gravel. We moved close. Dennis advocated for us all to step on the island at the same time. The rest of us urged him, as our leader, to take the first step. I took a photograph of him striding onto this feature, undoubtedly the first human to have ever done so. We followed. We all moved on to the island. Dennis said that the ice cap was part of the island. I paced off the dimensions of the gravel. 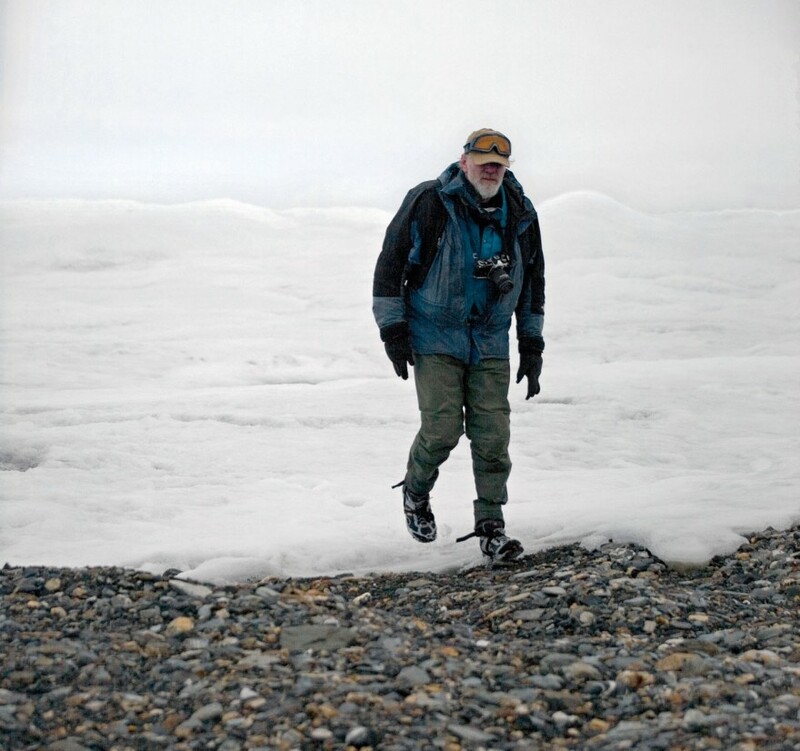 Dennis walked off the gravel, going out on to the sea ice around the island. From there, he made a photo survey of it. Then he came back and knelt down with his pack and camera. I think he was taking a GPS reading. I got out the Explorers Club Flag. I took a couple of photos of all of us, using the timer on my camera. Soon, they wanted to leave. Dennis told the others that I was going to stay back to photo-document the island without anyone on it. Dennis and the others left. I went in the water pool just north of the island and shot south. I went on the other side and shot towards Kaffeklubben. 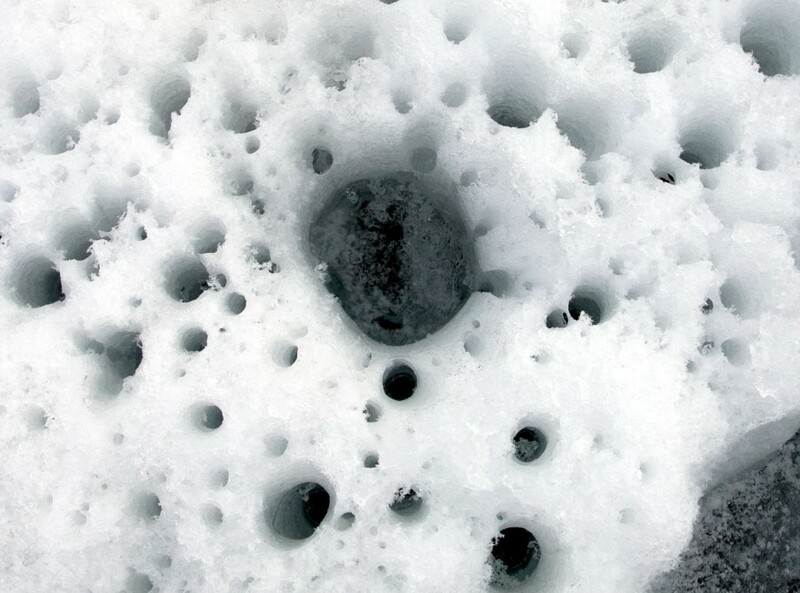 I took a few photos of the ice crystals and the strange cylindrical holes in the ice on the side of the island that was frozen over. Finally, I started after the others. No sooner had I done so than I remembered a general comment Dennis had made about leaving places, i.e., to check before you leave to make sure nothing is left behind. I dropped my pack and walked back to the island. Nothing was left behind that I could see. I retrieved my pack and followed the others, hiking quickly to catch up with them. Visibility was good at the level of the sea ice, so I could see them clearly. I caught up with them while they were taking a break. I asked if anyone had tasted the water. They said they had and that it was only slightly salty. I took a drink from a melt pool. It tasted pretty much like fresh water. When we got to the coast, I started up the stove. Some had soup. They said it was 8 p.m. and that we had been traveling for 12 hours. This surprised me. It seemed weÃ¢ÂÂd been traveling for just 4 or 5 hours! They wanted to start back, but I was very sleepy and wanted to hang out. They left me with a rifle. Then they headed east down the beach till they disappeared from view. I curled up in my 8000-meter parka top, with only my thermal bottoms and medium weight fleece pants on, and I fell off to sleep. I do not know what time I woke up. Perhaps IÃ¢ÂÂd slept about two hours, maybe less. It seemed like less. When I woke, I was feeling a bit chilled. There had been a slight Arctic breeze licking my body while I dozed. There I was, all alone on Cape James Hill. I had slept without a sleeping bag on one of the northernmost beaches in the world. I was in complete isolation. I looked around. Dennis said heÃ¢ÂÂd seen only one polar bear in ten years, but the sense that something was watching came over me. There was nothing in sight. I put some water on the stove. I walked around in circles and back and forth in a sort of quasi-hypothermic state, drained of energy. I made some coffee. I didnÃ¢ÂÂt really feel like walking. It occurred to me that even though I normally like to collect a few rock souvenirs from interesting places, IÃ¢ÂÂd forgotten to do so on Stray Dog West, even though John had been doing it and talking about it while we were there. I regretted not having taken some samples from Stray Dog West Island (SDW). I hoisted my pack and slung my camera in front. I placed the rifle crossways at the top of my pack as IÃ¢ÂÂd seen John do. It seemed to be awfully heavy, and I more greatly appreciated the fact that John had carried it to Camp 2 and Stray Dog West. On the trudge eastward on the beach, I kept my eyes down a lot, looking for interesting stones. After perhaps a kilometer (east), I saw a stone that looked like it was chipped around the edges. Could it have been a cutting tool, I thought? 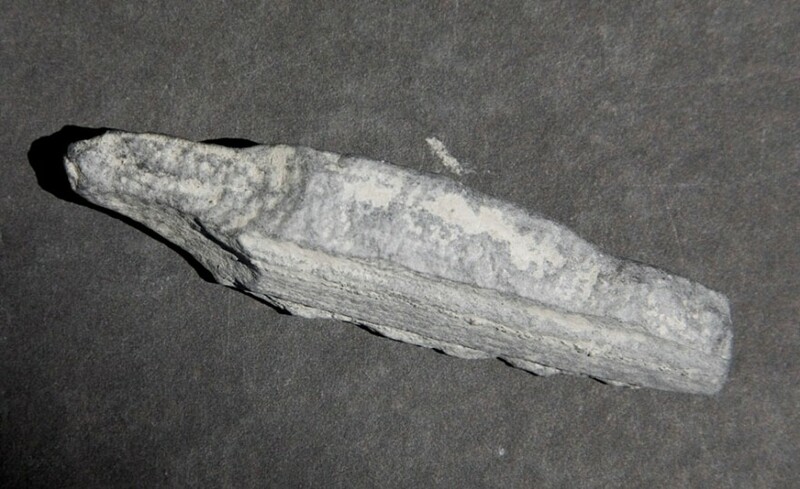 It wasnÃ¢ÂÂt exactly an arrowhead, but it looked like it could have functioned like a knife. I found another one very close to the first. 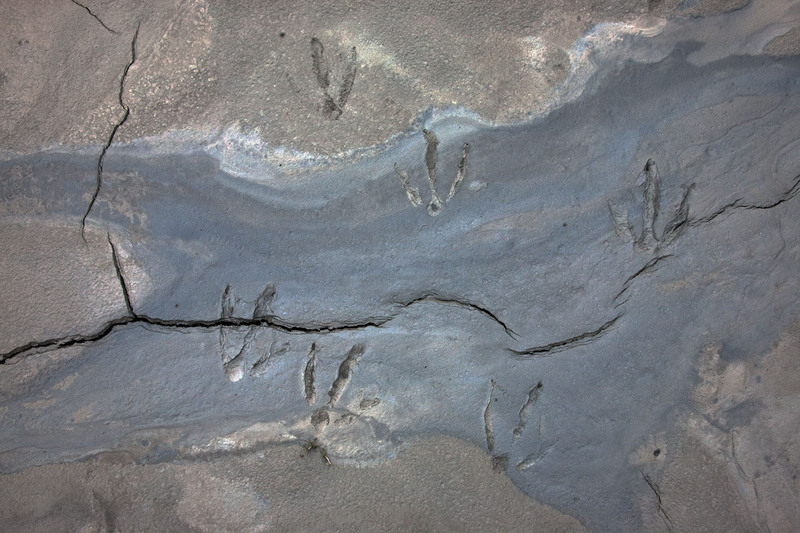 At one point along the walk, I came to a place where large bird tracks were imprinted in earth tones mixed with gray in flat semi-hard mud. After maybe an hour or an hour and a half, I saw a low ridge ahead. I convinced myself that when I reached it, I would be able to see the camp just beyond. It seemed to take a long time to reach it, and even when I got close, there were dips, little ravines and river washes to cross, making it more time-consuming. When I reached the ridge, I could see fairly far, but the camp was not in sight at all. I must be on the right course, I thought, and I trudged on. I was feeling tired, very tired. Prior to my nap, I had been awake for just about 46 hours with only 4 hours sleep. In the preceding 48 hours, IÃ¢ÂÂd had six hours sleep. Earlier, I had seen the footsteps of the others in a flat ravine at a riverbed crossing. But after that, I saw no more. I went on. As I approached the next little ridge, I convinced myself again that I would find the camp just on its other side. But again, I was disappointed. Still, no more signs of footprints. I looked ahead. Was it possible that IÃ¢ÂÂd just walked right by the camp? It occurred to me that If I had somehow missed it, I could walk on forever eastwards without finding it. I came across pieces of a broken bobsled. I had not noticed this when we traveled along the coast in the morning. Not only that, but the terrain did not seem to indicate I would find that broad draining basin where our camp was any time soon. Funny, the Greenland that normally seemed so pleasant to me now somehow seemed foreboding. At least I had my stove and fuel with me! Up till now, it seemed that the landscape was not as open as IÃ¢ÂÂd remembered it. Finally, as I moved further east, vistas of distant places opened up. I rounded a small rise and came to some boggy ground near the coast. I looked. There were the tents! Relief! Still, the last few hundred meters seemed a chore. 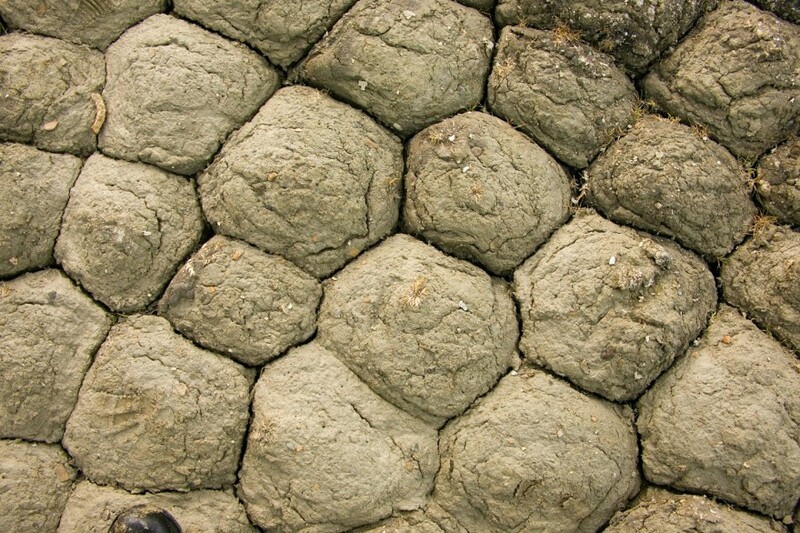 Yesterday, the pentagons and hexagons formed by the mud were mostly small. Here, a few hundred meters from camp, there were some huge, well-formed pentagons. They were about two and a half feet across. I got to camp. The others were sleeping. I got in my tent, then in my sleeping bag, and I dozed off. Tundra, Coast Near Cape James Hill, Greenland, 2007 – A photograph of the small hexagons – I did not have the energy to photograph the large ones at the end of the day we discovered Stray Dog West. I slept till about 3 p.m. I had the idea today to interview Dennis. Dennis came over and I invited him in. I asked him if I could film him. He agreed. I asked him not to pay attention to the camera. I asked him all sorts of questions about his feelings about yesterday, about Global Warming, etc. The interview lasted about forty minutes. I heard Bob. He was down by the river, walking towards the tents. Ã¢ÂÂWhat happened Bob?Ã¢ÂÂ I asked. I photographed Kaffeklubben for awhile. The sun shone against the river at my feet. There was some talk about tomorrow. I put my vote in to go to Kaffeklubben. By the time I retired for the night, the group plan was to go to Kaffeklubben in the morning. The walk out to Kaffeklubben started at about 11 a.m.
On the way to Kaffeklubben, I was next to Bob, who exclaimed, Ã¢ÂÂMy crampon broke!Ã¢ÂÂ One crampon, Bob decided, was good enough. He went off. Bob was the first one on Kaffeklubben. The rest of us followed. By virtue of the fact I was filming, I was last. When I stood on the island, the others were ready to go up to the cairns, a short walk up a small hill. By the time I was on top, Bob was going back. 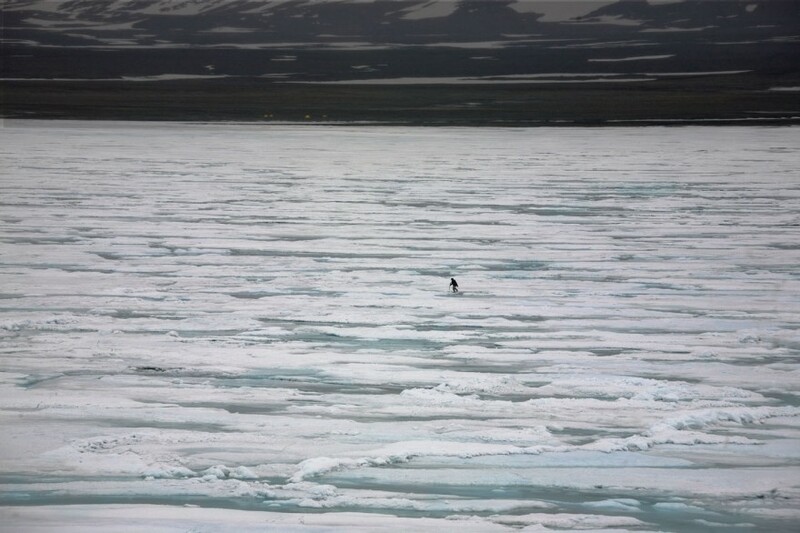 I filmed and photographed him walking on the sea ice towards camp. I stayed there till he was a small dot in the distance. I turned my attention to the rest of the group. Some stood next to the far cairn on the northern tip of the island. Some were walking back. I met up with John. The weather was cloudy and there was a hint of precipitation in the air. John and I lit up a Havana cigar that IÃ¢ÂÂd been keeping in a cigar box for going on 10 years. Our conversation, there, on the northern side of the official northernmost island in the world, smoking one of the most famous cigars in the world, the Cohiba, was, as usual, a good one. Then, he left. I followed the shore of Kaffeklubben till I was at its northernmost point. 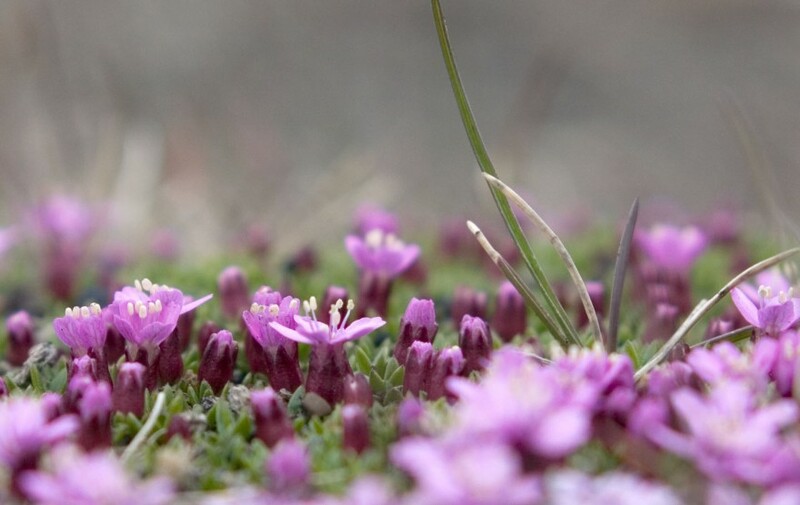 Back on shore, I walked slowly, looking for the first flower I saw, which would be the, or one of the, northernmost flowers in the world. I had seen many yellow flowers earlier, but now I saw none. 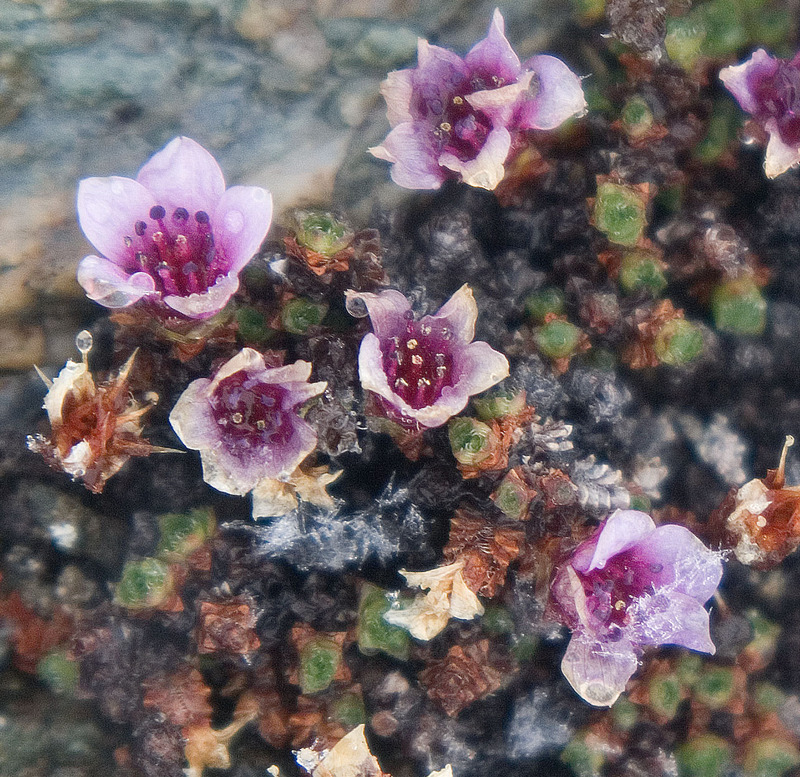 The first one I saw was Purple Saxifrage. It started to snow. Hastily, I took a few photographs of this clump of flowers. I didnÃ¢ÂÂt take the time to set up my tripod. I was concerned that if it snowed heavily, I might lose my landmarks. I hurried to the top of KaffeklubbenÃ¢ÂÂs northernmost high point, passed its cairn, then to the other hilltop on its south end, to its cairn, then down on to the sea ice. Of even more concern than losing the tracks of the others was if the cloud bank dropped and hid the camp or the coast altogether. For the first third of the walk back, I saw almost no sign of footsteps. Indeed, the cloud bank dropped. For a while I could not see the coast. In the worst scenario, since I had no compass, I could have walked straight around and back out to the sea ice towards the North Pole. Fortunately, behind me, Kaffeklubben remained in sight. The possibility of serious error was disconcerting, as I did not have a stove and I did not have much food. After a time, the clouds lifted somewhat, and I could see the camp again. It snowed a good deal of the way back. I crossed the river to camp. Everyone was in their tents: Holly and Dennis in one, Steve and John in another, and Bob alone in his. I told Dennis I was back. Steve and John said they had hot water for me, and a meal if I needed it. I opened the door to my tent, got inside, cooked a meal in my vestibule, satisfying my hunger and thirst, and then I got a good nightÃ¢ÂÂs sleep. We woke and departed at about 7 a.m. for Base Camp. I walked with Holly and John. We took the same Ã¢ÂÂhighland plateauÃ¢ÂÂ route IÃ¢ÂÂd used the other day when returning to base camp. When we got within sight of base camp, I looked up. I noticed what looked like a rock some distance off, but one that was not there a moment before. I called it to the attention of the others. It was, in fact, a muskox. John loaded the rifle. We tried to follow but we fell behind it. We met the others at base camp. John, Holly and I went to photograph the muskox, which was now grazing a few hundred meters down river on the riverbank opposite the camp. The muskox took off into the hills. John and Holly returned to base camp. I walked up the slope. I photographed wildflowers. Then I tried to find the muskox. It was not long before I found it looking out to the sea ice. He got up and walked towards me, grazing. I moved behind a rock, afraid. I photographed it. It moved away and eventually took off. 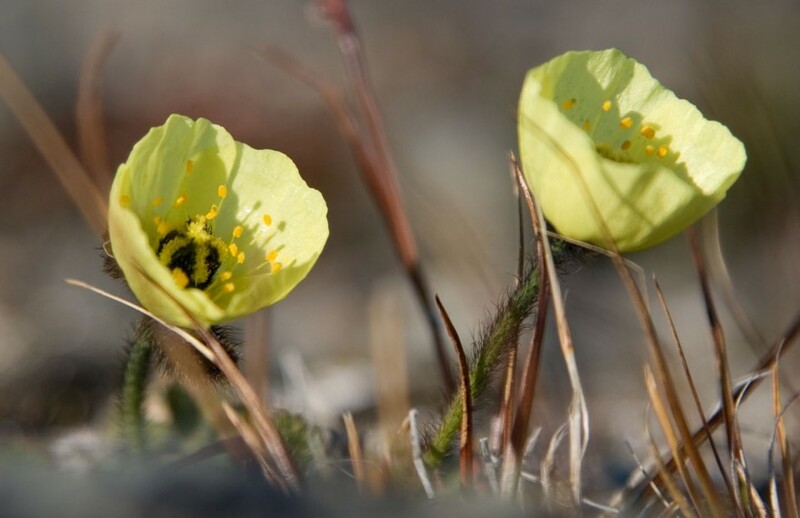 Arctic Poppy [Papaver Dahlianum], North Coast, Greenland, 2007 – I lay down in the tundra to take a photo of these beautiful miniature flowers. On my way back, a Sanderling flew by me and settled in a hole. She was well-camouflaged. After awhile, she got up. Four gorgeously-marked chicks appeared. They scuttled around. 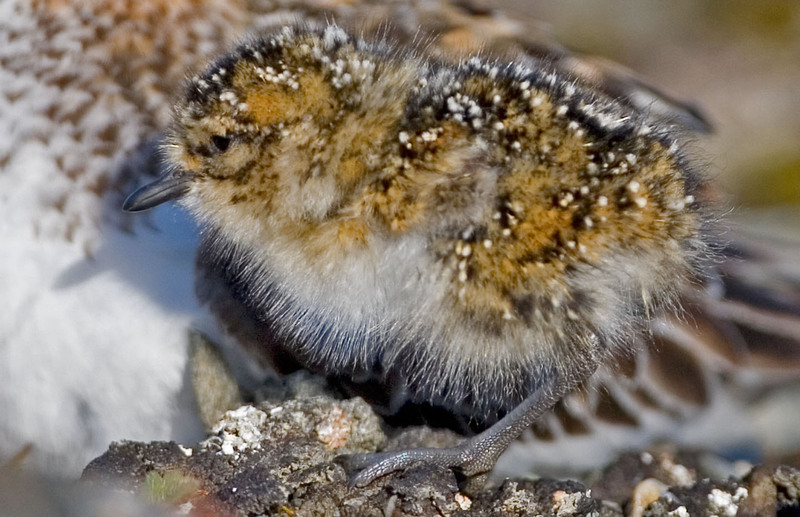 Then the Sanderling seemed angry and became vociferous. The chicks returned, going under her wing. On my return to camp, Steve and I talked for a while. I put up my tent, ate a meal, then fell asleep. 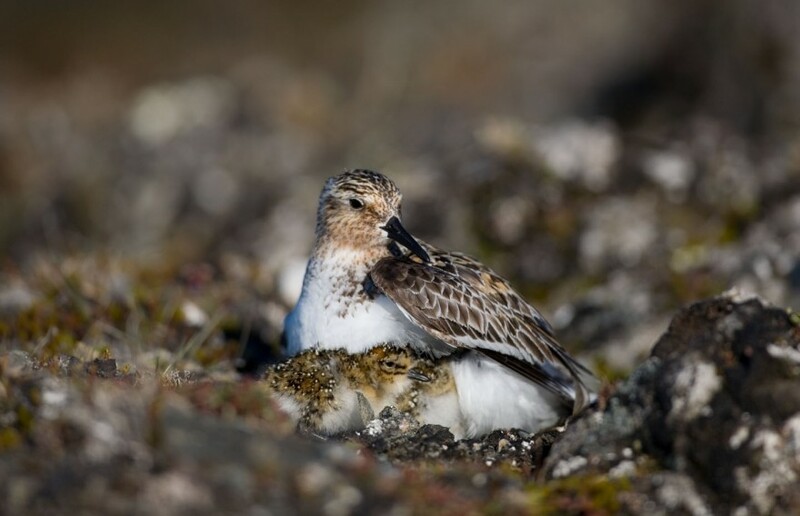 Sanderling [Calidris Alba] with Chick, Bliss Bugt, North Coast, Greenland, 2007 – I crawled on my hands and knees to get close enough to this Sanderling. She began to trust me. 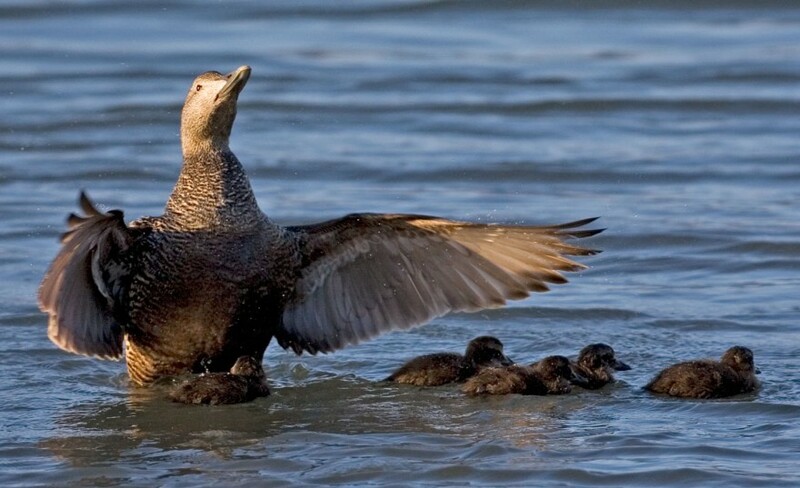 She let her chicks out from underneath her belly. They were no doubt restless in their nest. They wandered around until their mother called them. Then they ran back underneath the safety of her body. We woke and got ready. The Twin Otter arrived at about 11 a.m. We put our bags next to it while the pilot and co-pilot primped the runway. 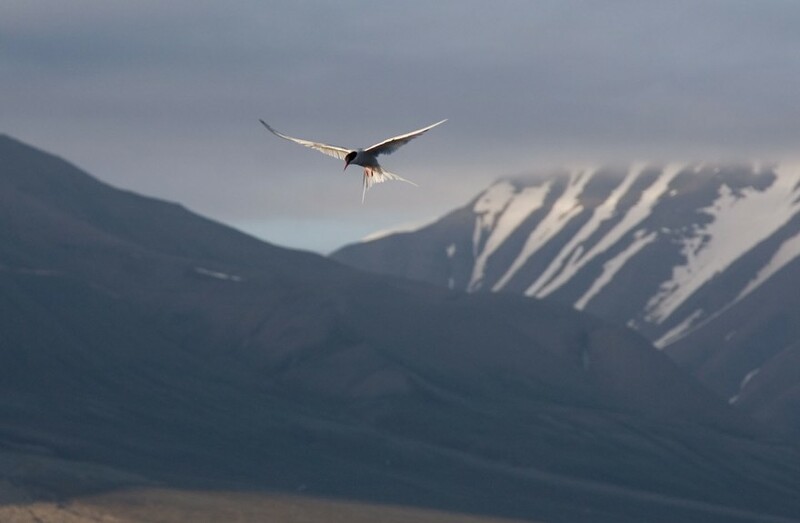 We took off at about 11:30 a.m. We flew over Kaffeklubben, then to the site of the island Dennis had explored in 1996. We went over the site of Orange Island, but there was nothing there. Then we went over the place Dennis and others had visited in 2003, a place that was more northerly than Stray Dog West. Dennis later reported to me that its cap was covered in ice. Then we went over Stray Dog West. Dennis had a broad look of satisfaction on his face. When the co-pilot opened the cockpit window to film, I asked if I could put my camera out. Then I hooked my foot around one of the supports to the seats, leaned forward, and I took photographs (without glass in the way) of Stray Dog West. Stray Dog West From The Air, Arctic Ocean Just North of Cape James Hill, Greenland, July 16, 2007 – Four days after the discovery of Stray Dog West on foot, we flew over the island on the way back to Norway. 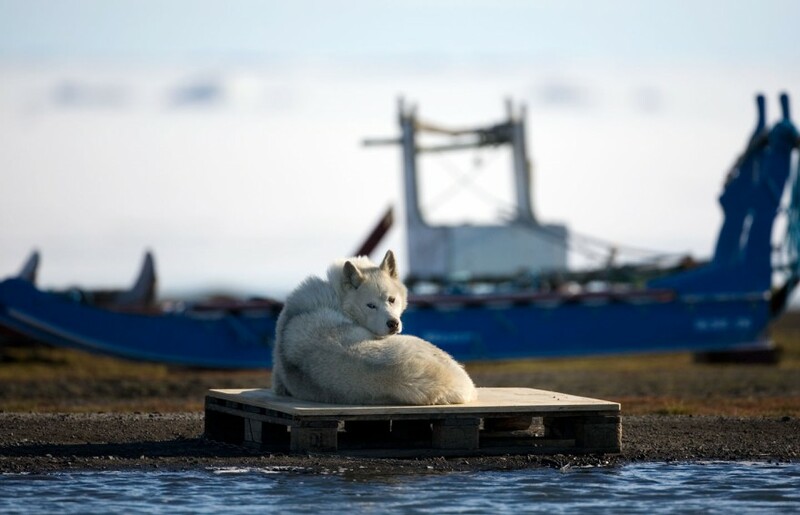 In 2007, Stray Dog West was believed to be the new northernmost point of land in the world. The other more northerly features visited in prior years were no longer visible and were presumed to have disappeared. In 2008, a Danish expedition reconfirmed the existence of a more northerly island at 83 degrees 42 minutes north latitude. (See below under Overview.) Our expeditionÃ¢ÂÂs tracks are visible in this photo when it is enlarged (upper left center). This image appeared in Esquire. 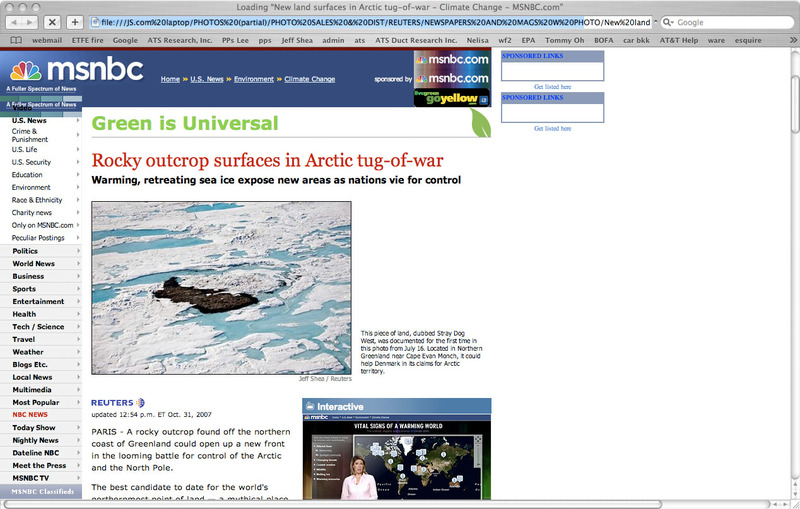 It also appeared on MSNBCÃ¢ÂÂs website, courtesy of Reuters. We soared into the mountains of Greenland. 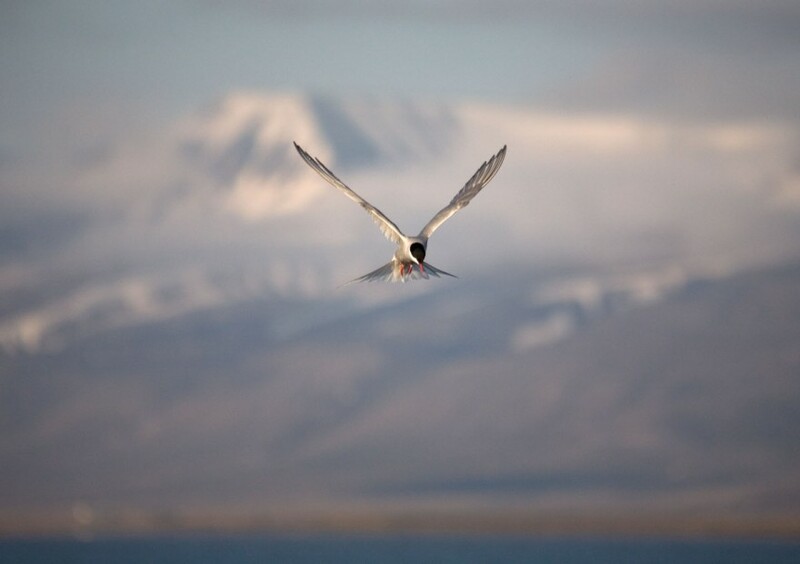 The pilot descended to about 150 feet over the floor of a tundra valley. Later, higher up, we flew past a herd of muskoxen. They ran. We flew over the Sifs Glacier, which was impressive. We picked up a man at Citronen Fjord, then dropped him off at Station Nord. There, we got out for a short time. Then we flew over Peary Land, which was fantastic. 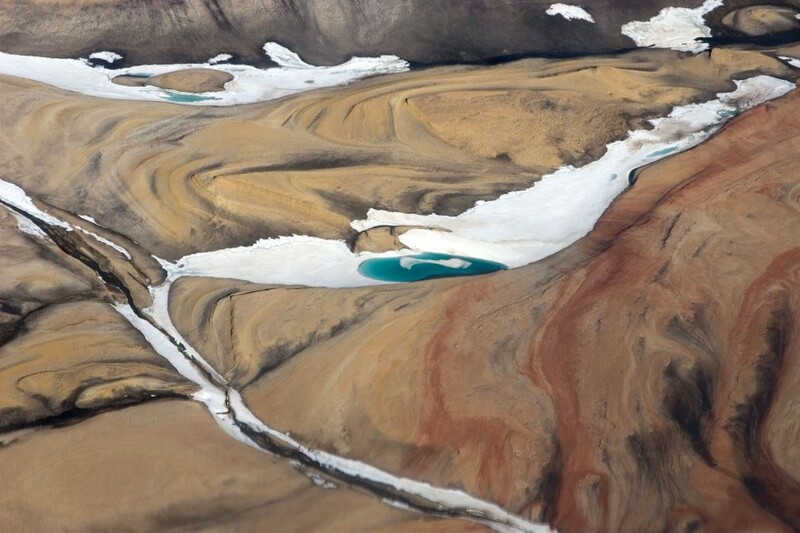 Peary Land Aerial, Greenland, 2007 – This photo was taken through the window of a Twin Otter. The landscape, as Dennis Schmitt had described it to me before the expedition, was Ã¢ÂÂlike Mars.Ã¢ÂÂ Indeed, it was otherworldly. This photo appeared in Esquire in October 2007. 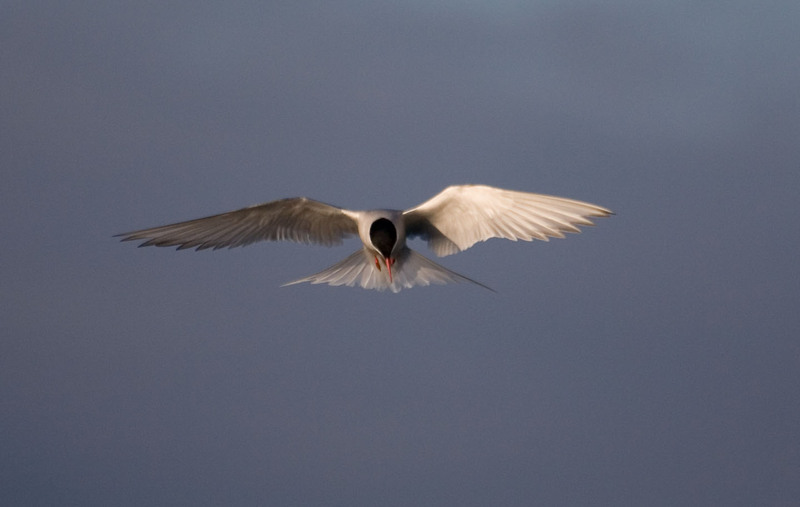 Then we went over the open water to Svalbard. Svalbard was breathtaking from the air. We landed in Longyearbyen. At about 2:30 a.m. 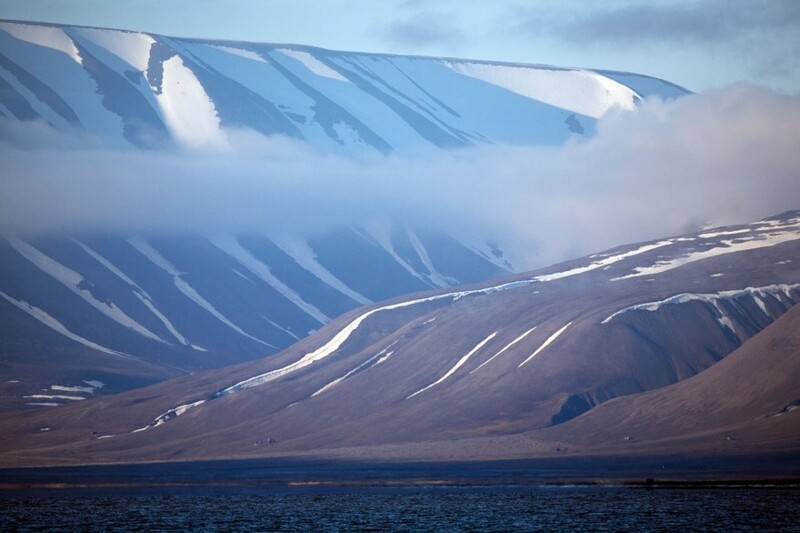 I went out to take photos of the escarpment above Longyearbyen. I photographed the Arctic Cotton illuminated by the sunlight. I went back to the camp and photographed the birds. Then I slept at about 5 a.m. or 6 a.m.
American Alpine Journal (2004, Schmitt), Greenland, The Far North, Jensenland, explorations of most northerly land. American Alpine Journal (2004, Jancik), Greenland, The Far North, Jensenland, historical timeline of the search for the northernmost point of land on Earth. Dr. Ko De Korte, on ornithology and illuminating constitution of impermanent islands. Reports from Jim McCrain, filmmaker on events surrounding the 2001 RTOW expedition. 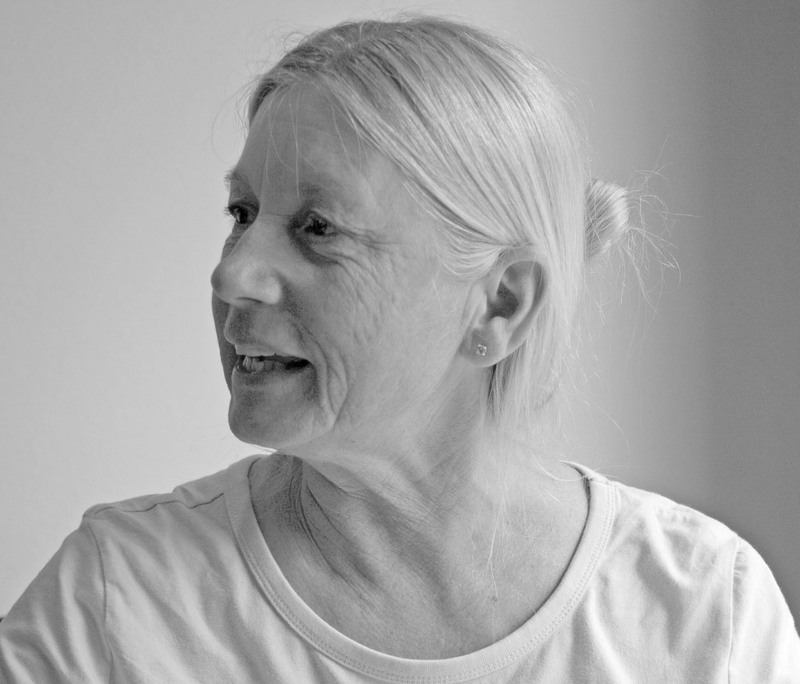 Ruthmary Deuel, confirmation of factual circumstances of 1995 flyover of Kaffeklubben area and other related details. 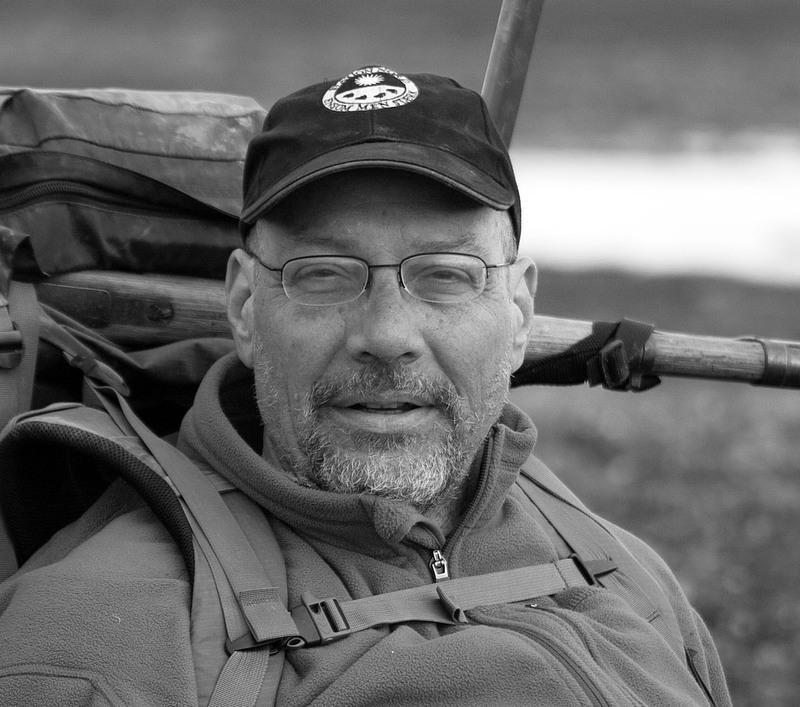 Dennis Schmitt, accounts of 1996, 2003 and 2007 expeditions, botany, geography. Adam Garde, Senior Research Scientist, Geological Survey of Denmark and Greenland, written discussions concerning constitution of islands. Professor Dr. Lourwrens Hacquebord, Physical Geography/Archaeology, Arctic Centre, Groningen Institute, University of Groningen, The Netherlands, as quoted. 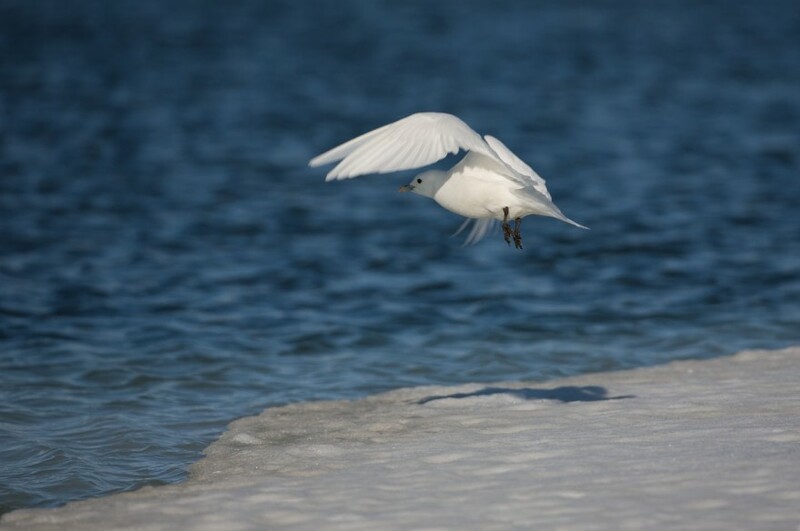 Ivory Gulls Breeding on Ice by David Boertmann (National Environmental Research Institute, Denmark), Kent Olsen (National Environmental Research Institute, Denmark) and Oliver Gilg (Francheville, France). Email correspondence with Troels Jacobsen.